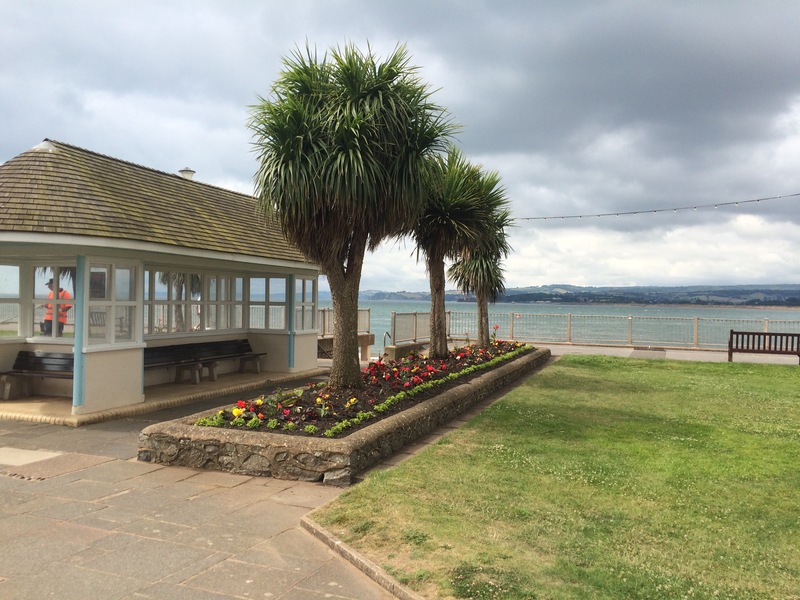 Holly dropped me back in Teignmouth early and I wandered around the town centre before getting on a train to Starcross. 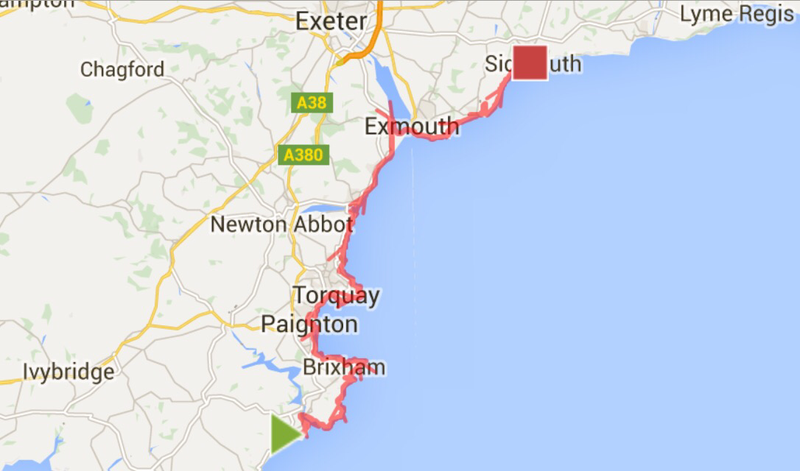 There wasn’t much to Teignmouth first thing in the morning and I had a pretty average coffee. 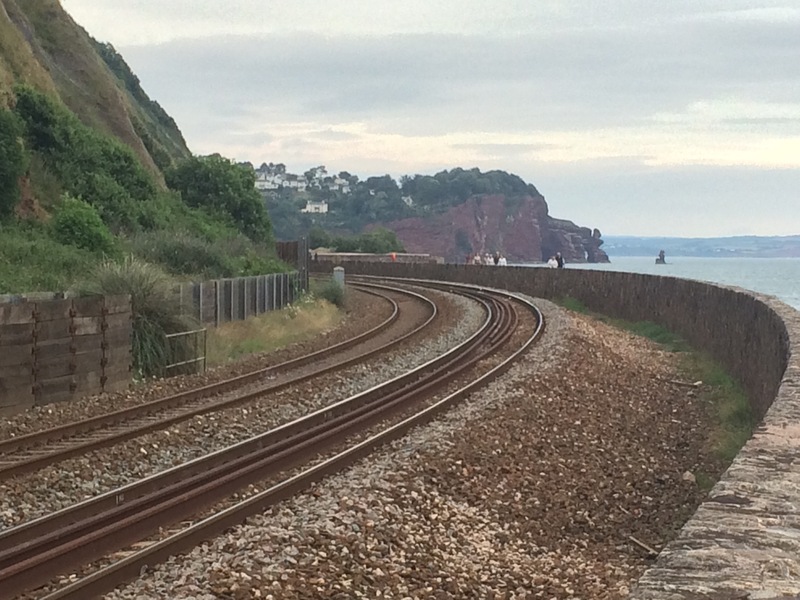 I had decided to get the train along the coast through Dawlish and Dawlish Warren as it looked more exciting than walking. The train went through a couple of tunnels bored through the cliff. 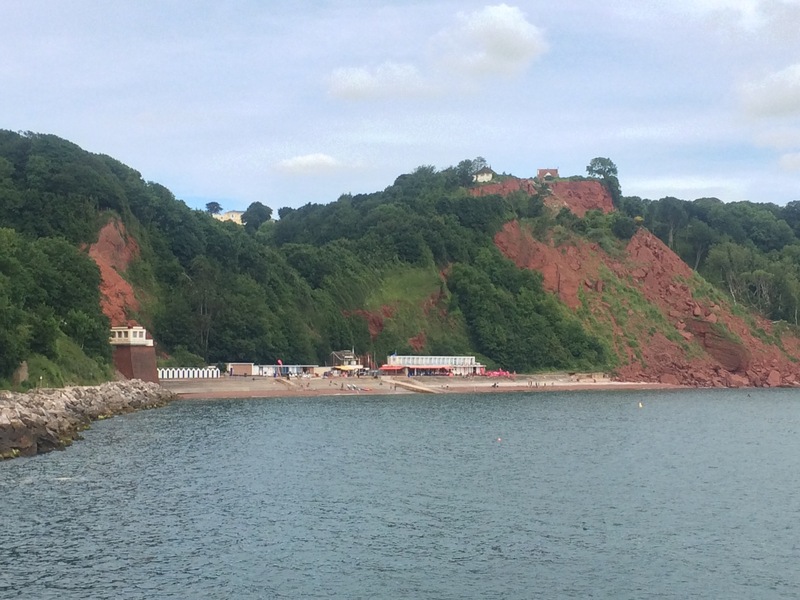 I enjoyed a lovely view of the red cliffs, and then of the town of Dawlish and the entertainment centre that seemed to be Dawlish Warren. 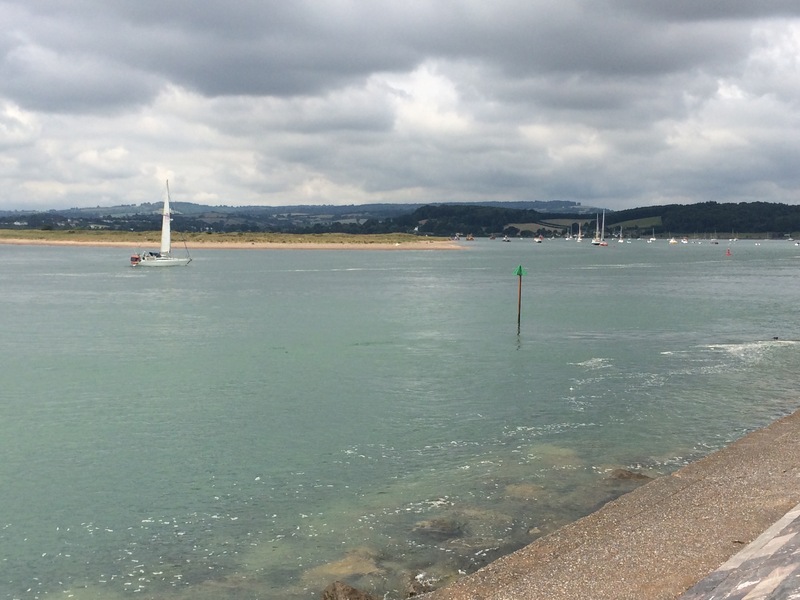 I arrived at Starcross in time to catch the first ferry across the River Exe to Exmouth. 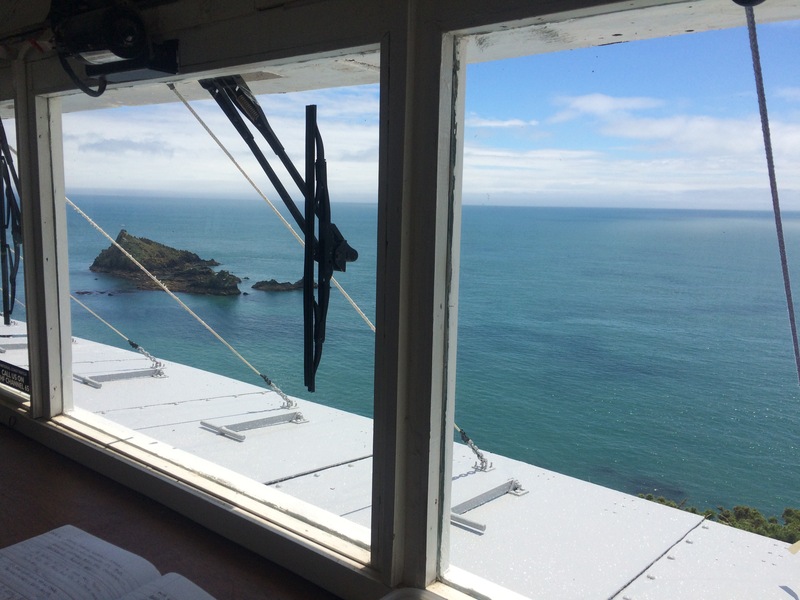 I’m not sure what it is with ferrymen in South Devon but this pair waited until we were supposed to leave before departing the vessel (leaving the engine running) to make themselves a cup of tea in the ferry hut. Clearly arriving at work 10 minutes earlier (when the start time was 10 am) was too much. 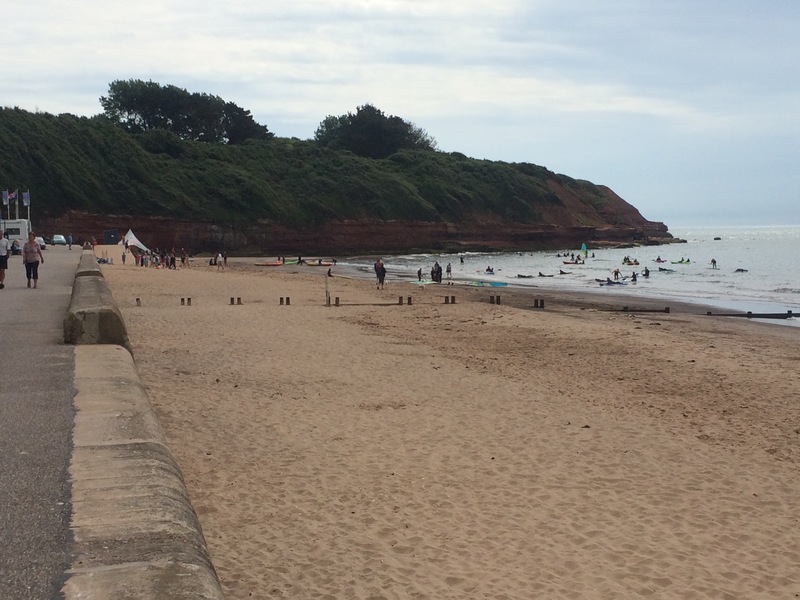 I walked along Exmouth’s sea front promenade, past the beach full of schoolchildren enjoying various water sports, and headed up onto the cliff at Orcombe. 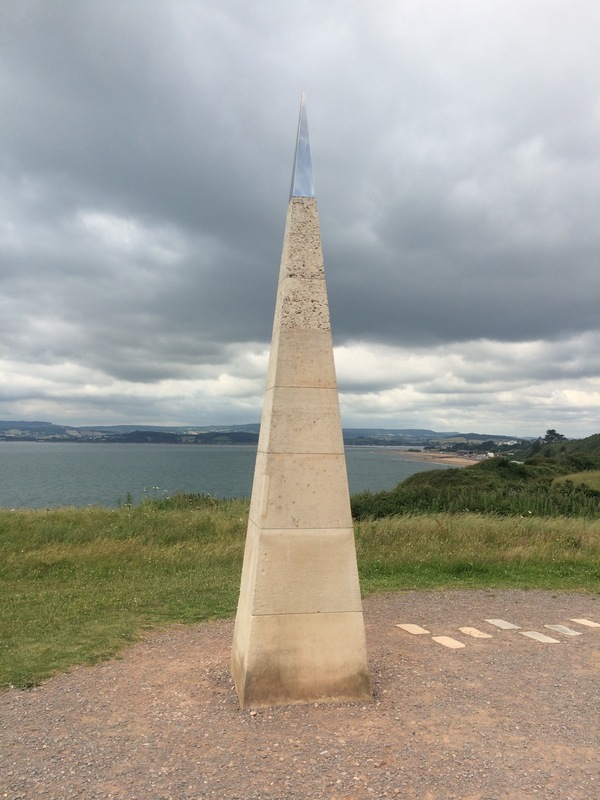 The Geoneedle at Orcombe Point signifies the Western gateway to the Jurassic Coast World Heritage Site. 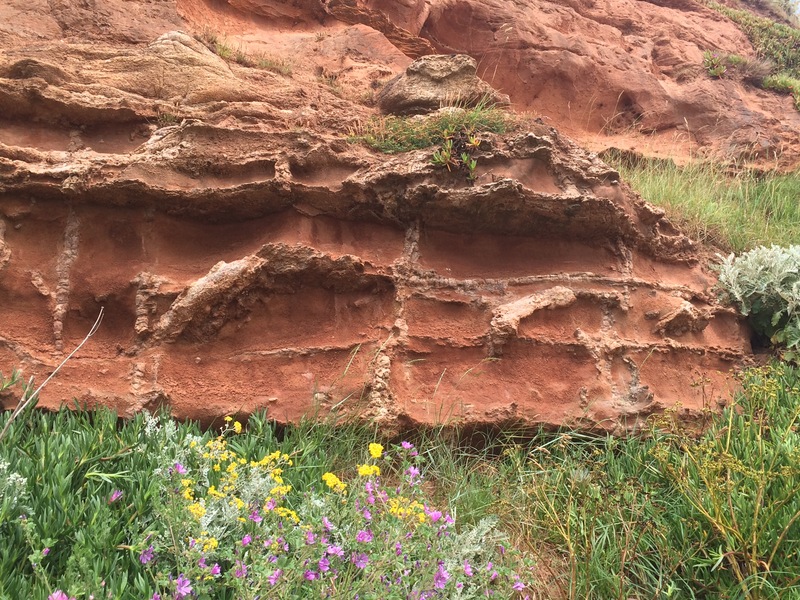 To call the 95 miles of coast between Exmouth and Studland Bay the Jurassic Coast is a misnomer as the rocks tell the story of the Triassic, Jurassic and Cretaceous periods. 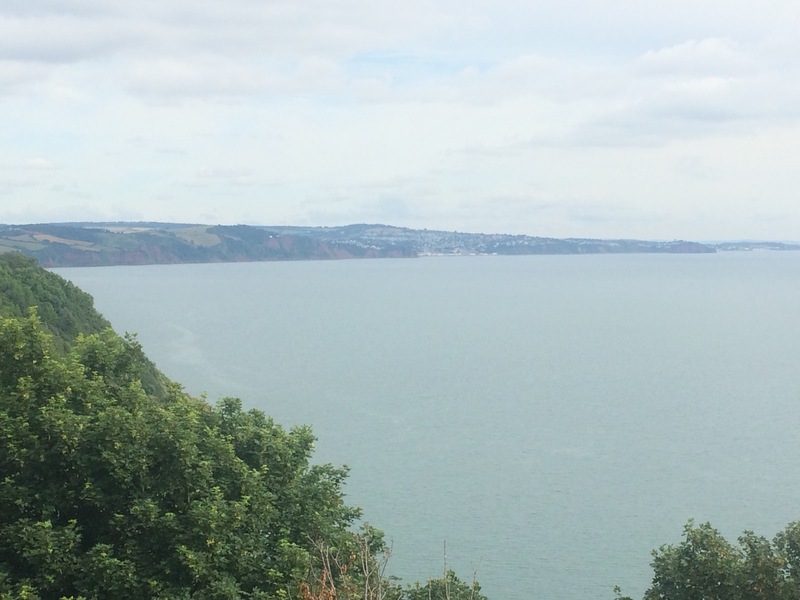 The oldest rocks, a mere 250 million years old, are the ones at Orcombe Point; the story unfolds from West to East so I am heading in the right direction. 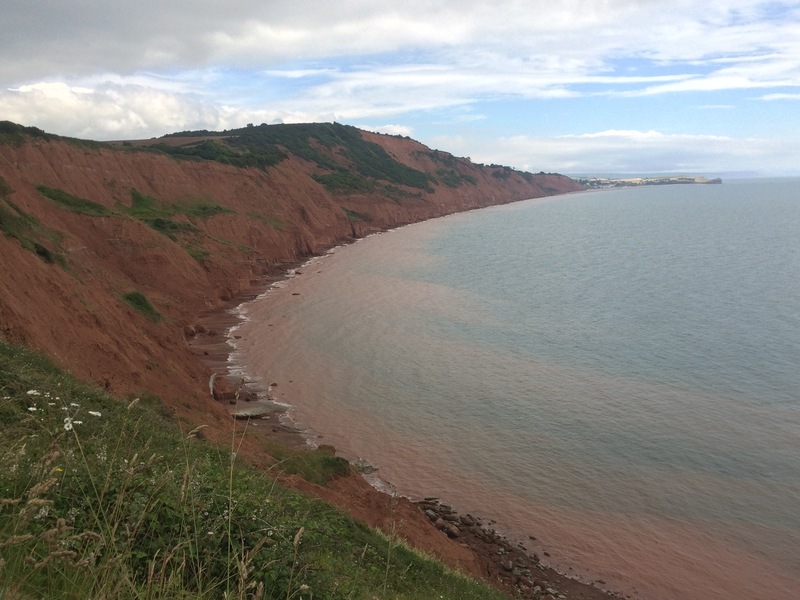 The Triassic cliffs are deep red and the shingle beaches are covered in quartzite, round pebbles, marking the course of a huge river that once flowed through a vast desert. 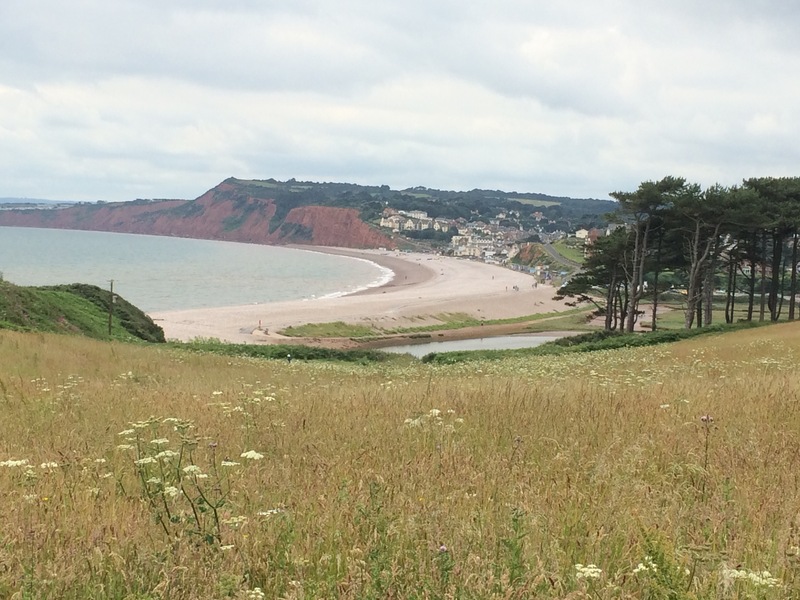 The river originated in Brittany and longshore drift causes the pebbles to continue to move East, from Budleigh Salterton to Chesil Beach and even as far as the Isle of Wight. I passed the enormous holiday park full of static caravans above Sandy Bay and next to the rifle range at Straight Point. 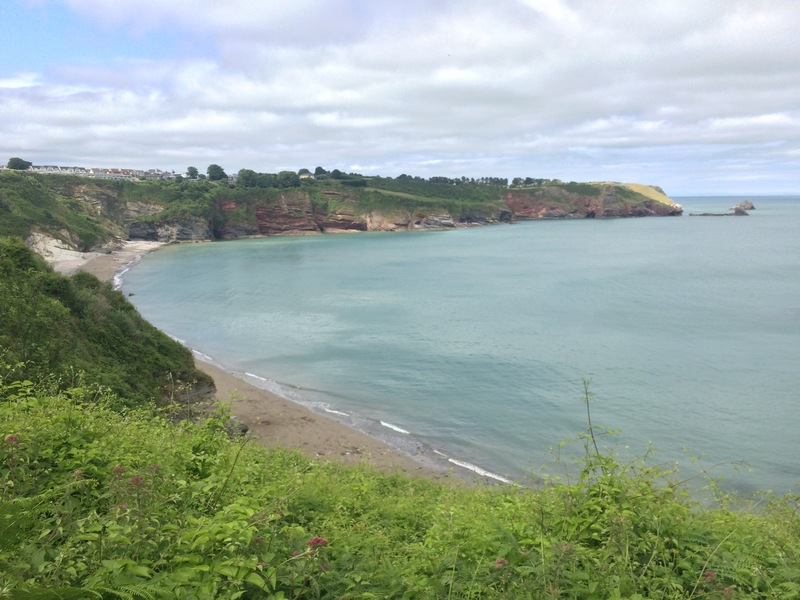 The colour of the cliffs was incredible and made the sea look muddy at their base. The path curved up and down like a wave. 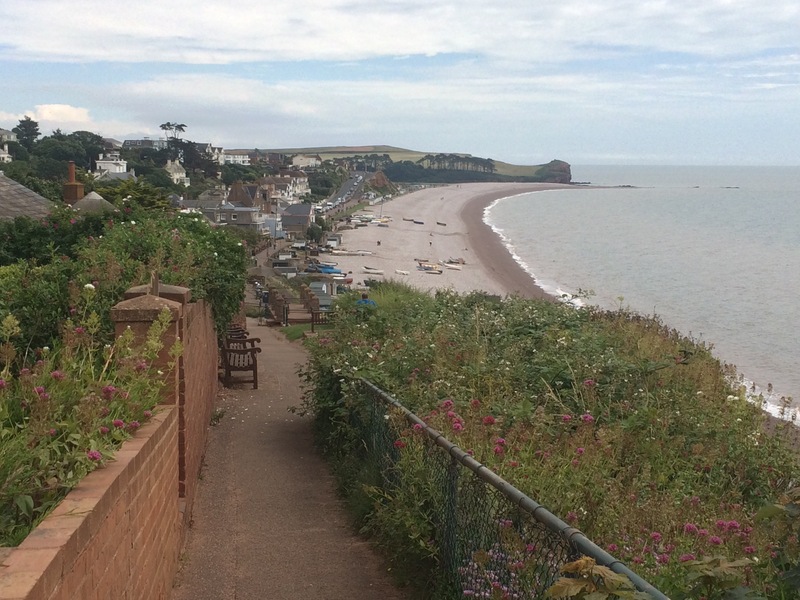 Many of the cliff top paths seem to be given names and The Floors took me to Budleigh Salterton. I passed straight by the town along the sea front. 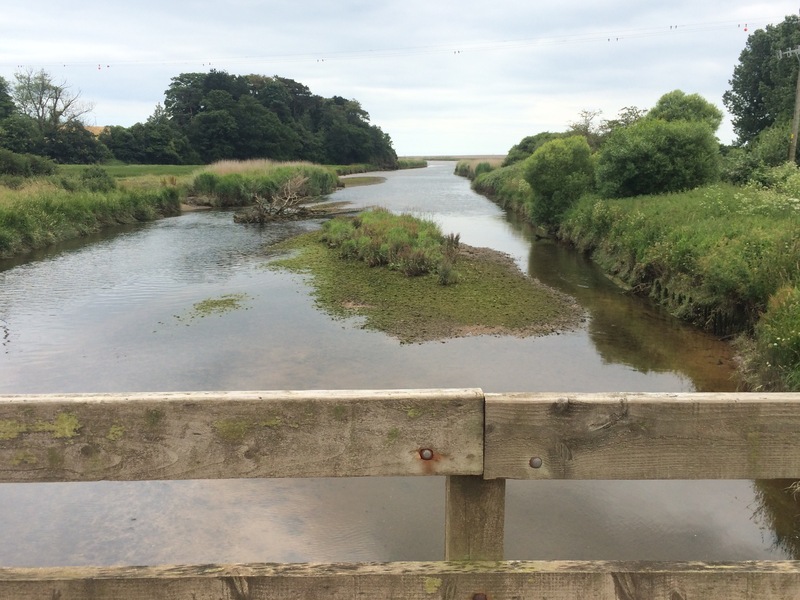 To cross the River Otter the path took me a kilometre inland to the first bridge and then back out again and over Otterhead. 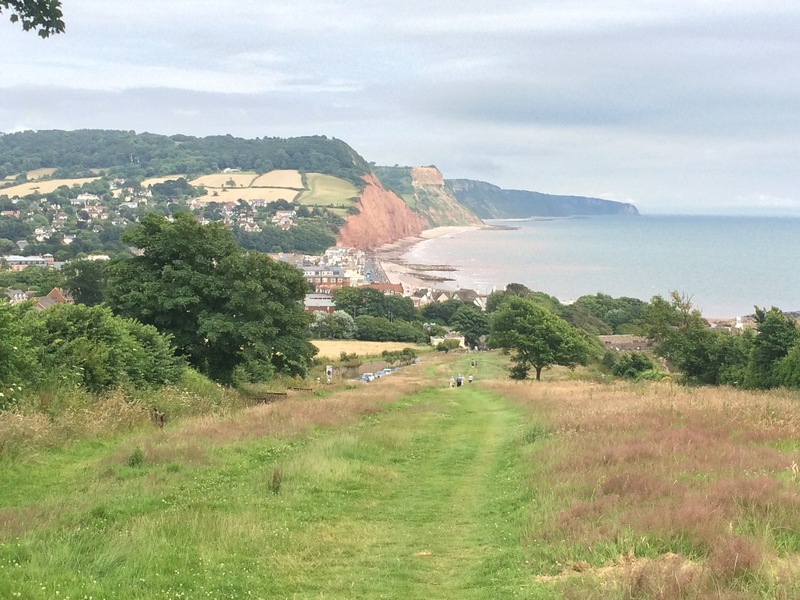 It was a long, curvy walk up and down to Sidmouth. 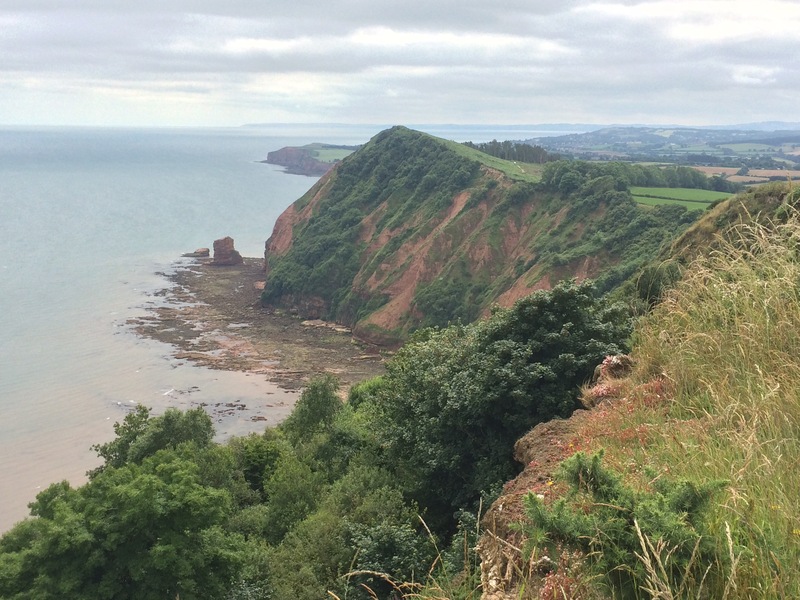 The standout sections were Ladram Bay and Peak Hill. 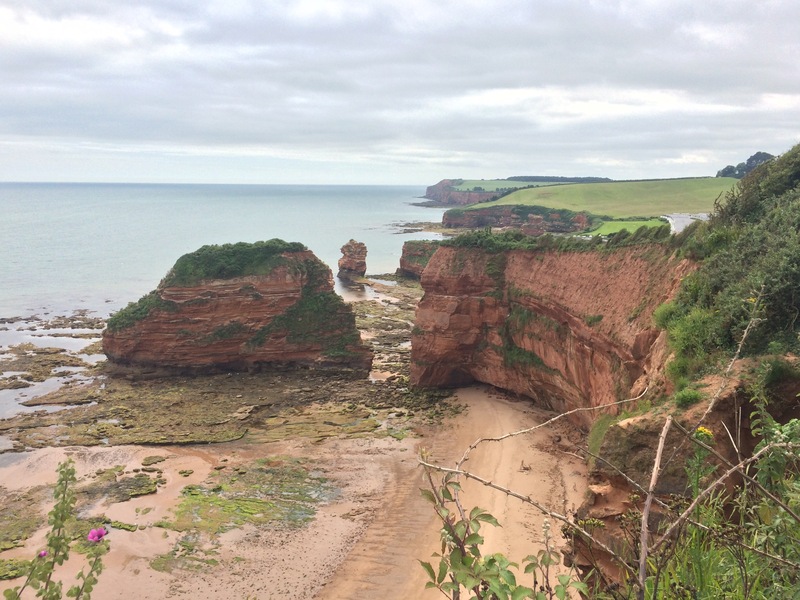 Ladram Bay had some amazing rock formations that had been created by erosion. 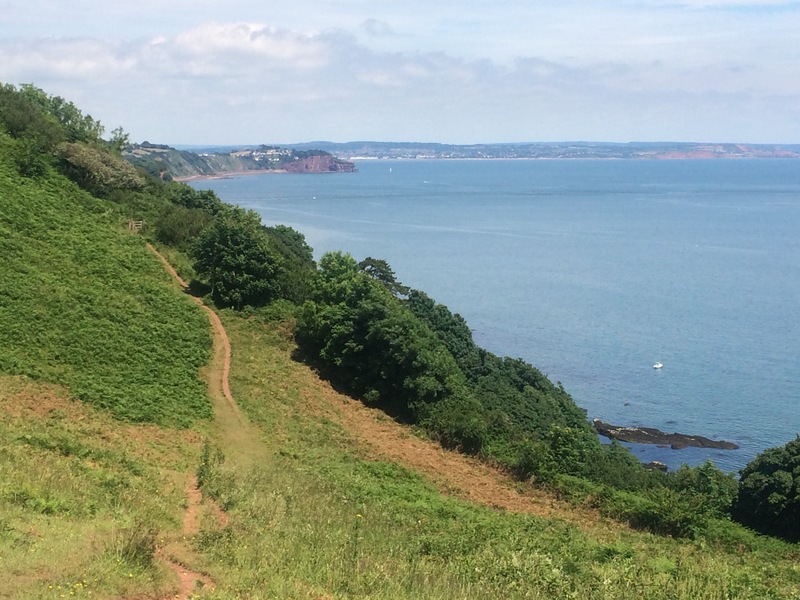 It was hot work climbing up Peak Hill (fortunately the path did not go to the top of High Peak just before it) but the view was incredible. 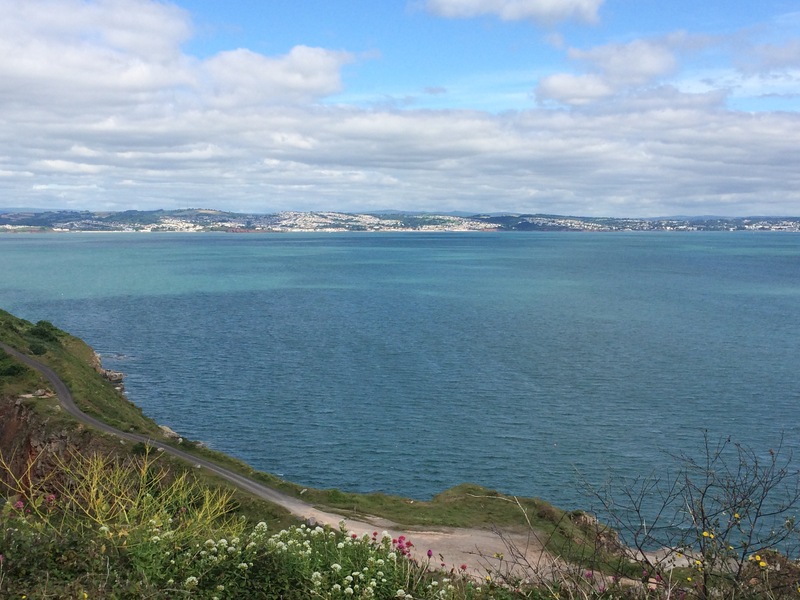 I could see all the way back around Lyme Bay to Berry Head at Brixham. 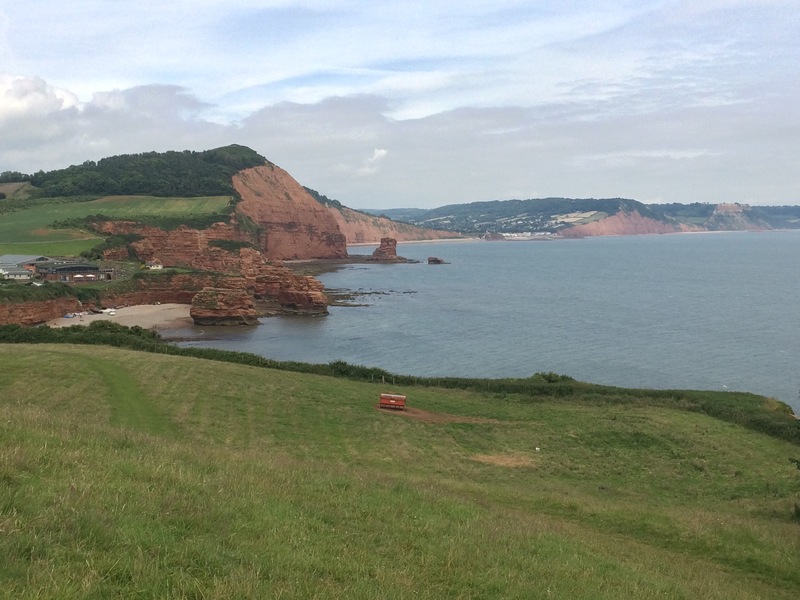 I had really picked the pace up as I climbed Peak Hill and descended into Sidmouth so that I made the 3pm bus. I had to get a bus to Exeter and then the train to Teignmouth, where Holly collected me for my final night in a bed for a while. 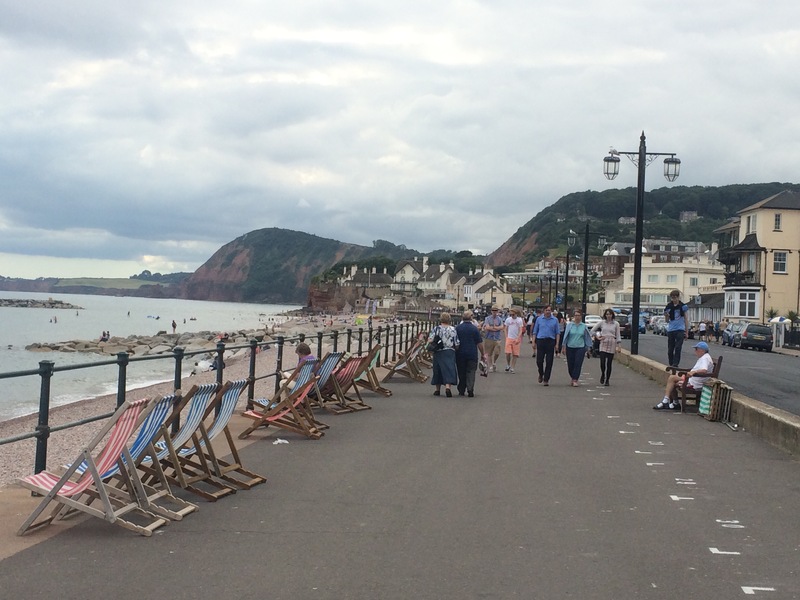 The Regency Town of Sidmouth looked like a great place to retire and I saw plenty of oldies playing croquet on the town’s court. Holly and I went out for a really nice pub dinner at The Elizabethan Inn in Luton, Devon. 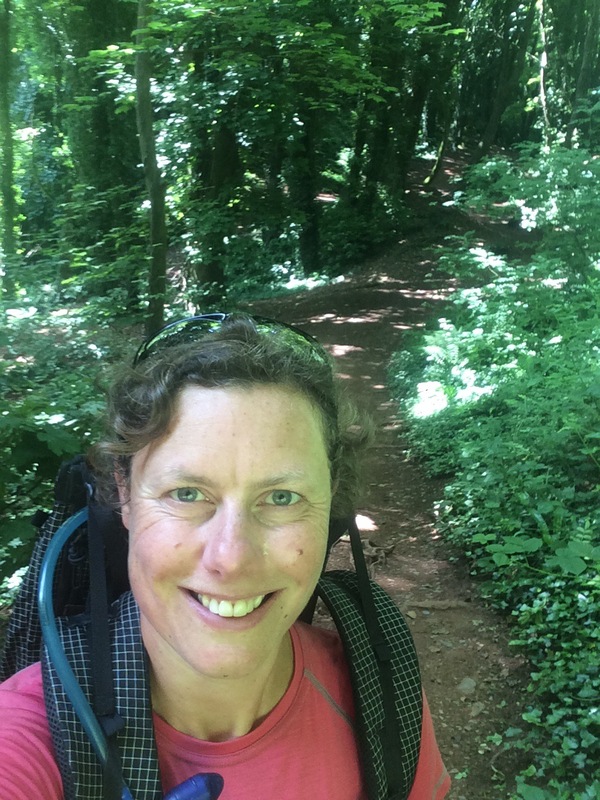 It had been my last day of walking for 9 days as I was heading back to Cornwall for a week off. 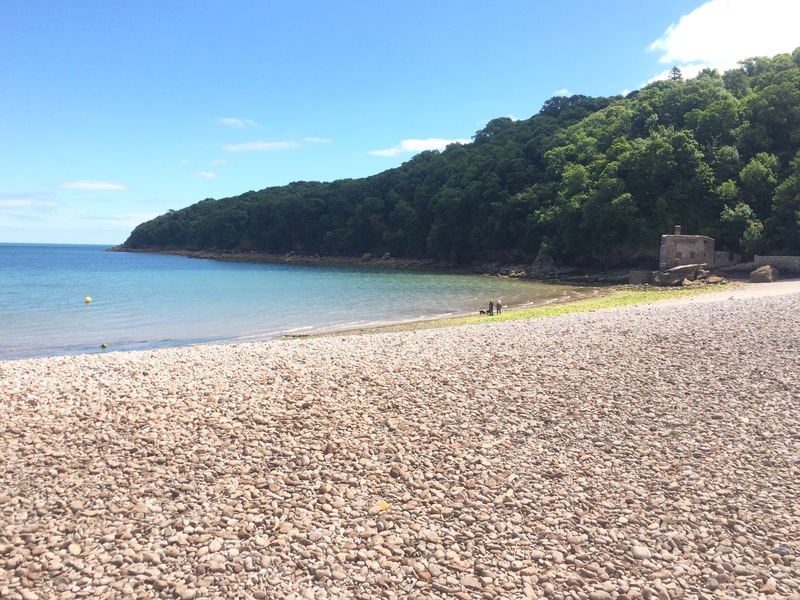 Holly very kindly drove me back to Kilmorie, Torquay, so I could continue from where I finished yesterday. 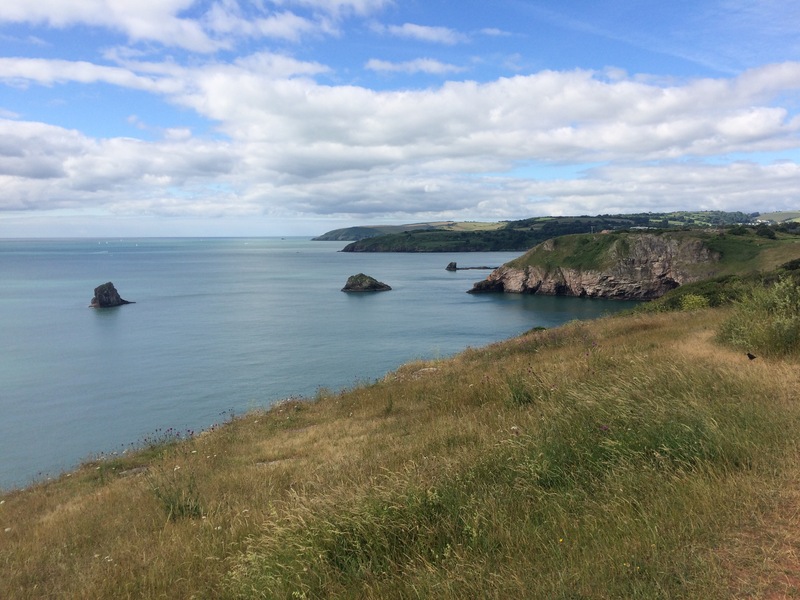 First was an easy walk along the very quiet road that curves around the headland. 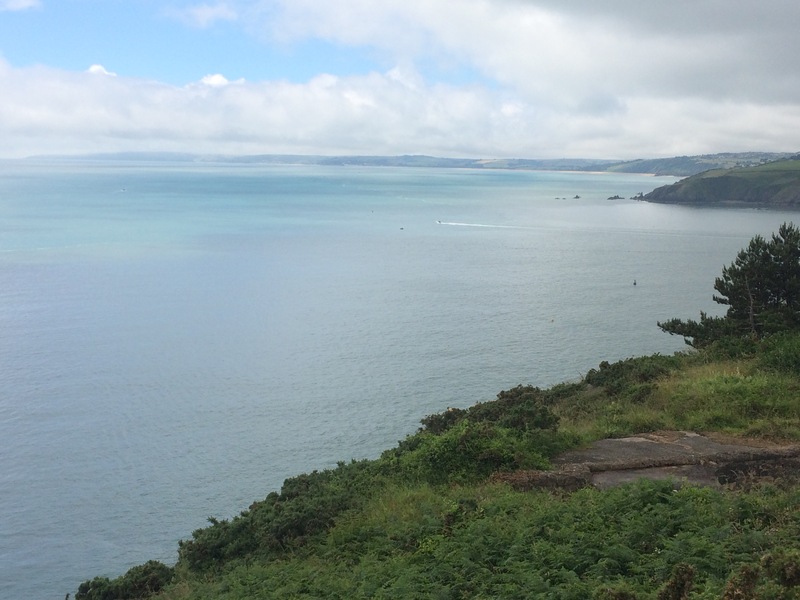 The light was fairly flat so views across Tor Bay were not as good as yesterday. Presently I entered woodland that covered the cliff side, reminding me of North Devon. It was a very hot day, which got sunnier, so it was a relief to be in the shade at times. 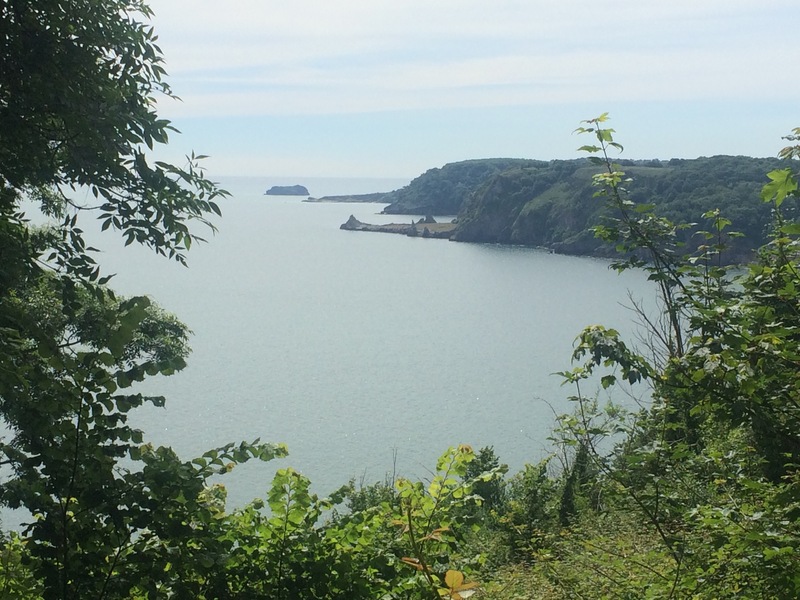 The beaches around Babbacombe Bay were all tucked into the base of steep cliffs and most required a long walk downhill to reach them. 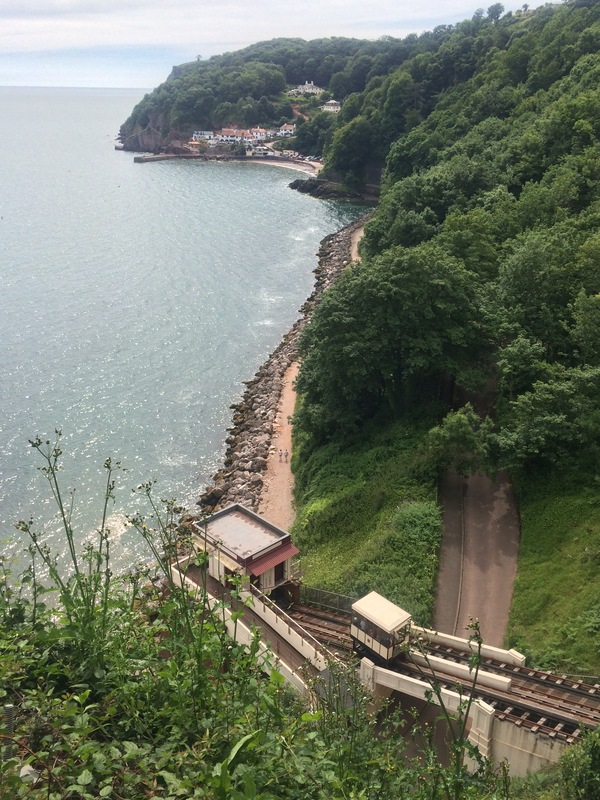 Oddicombe Beach did have a cliff railway, but I walked underneath it, traversing up through the woods. 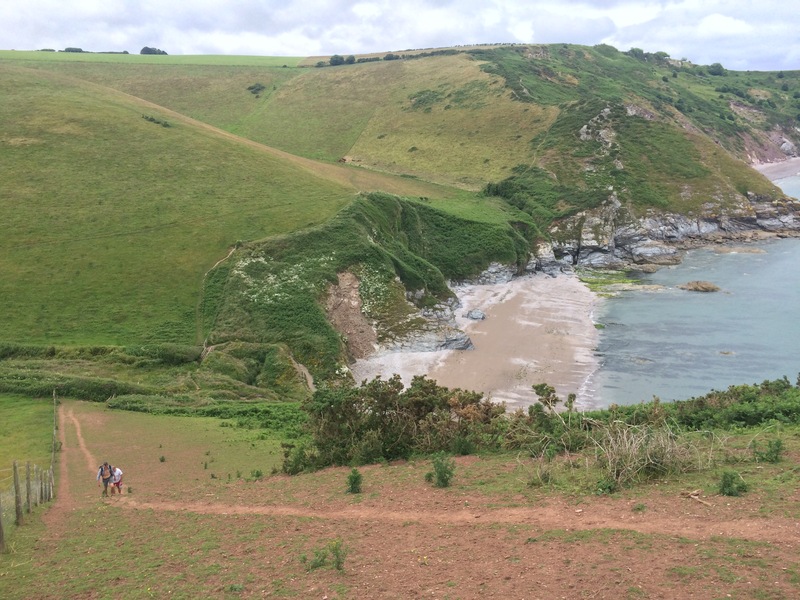 It was a very hilly walk today, again reminding me of the North Coast of Devon and Cornwall. In the still air it was very sticky but worth it for the views. 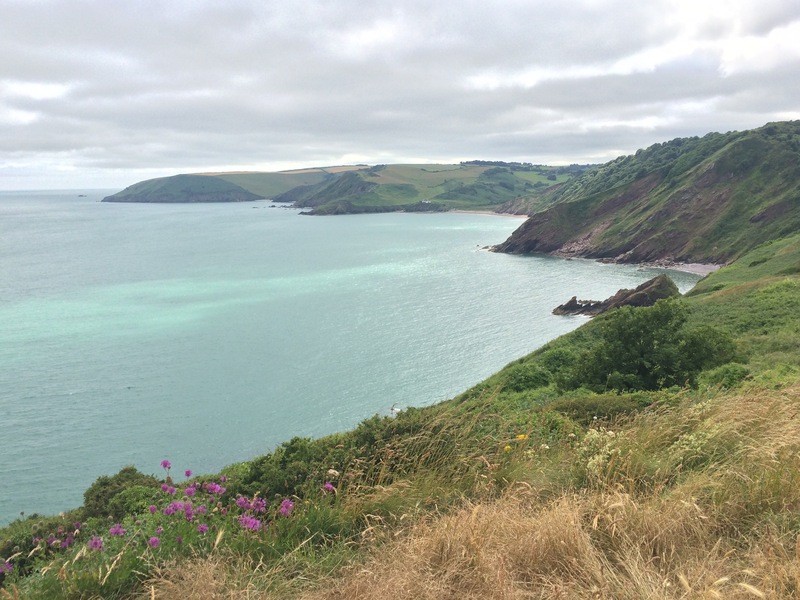 At Maidencombe I walked down the steep hill to the small beach and sat at the Beach Box Cafe for some lunch. The proprietor was busy making beef burgers for an evening BBQ that he will be doing throughout the summer (this concept of beach cafes opening for evening meals seems to be gaining traction all over the South West). After lunch I was more exposed as the trees disappeared. 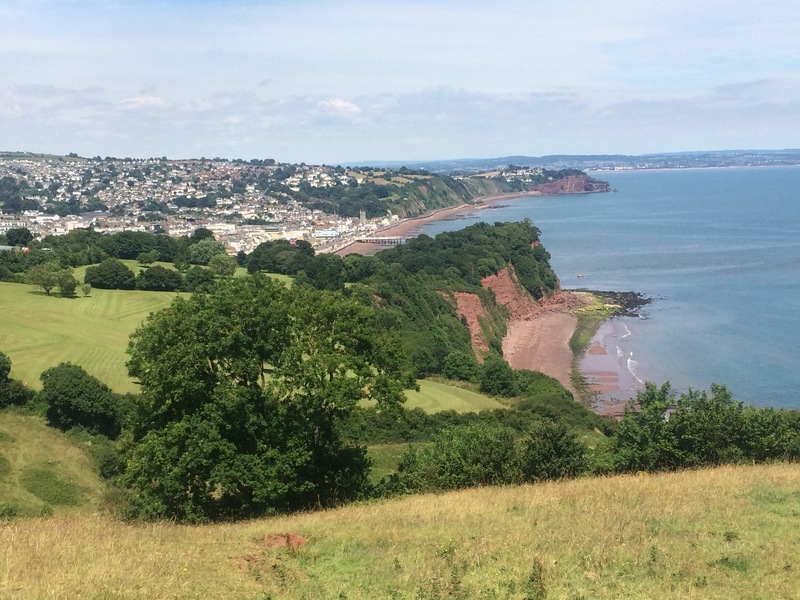 Fortunately it wasn’t too far to Shaldon and the River Teign but a hat and plenty of suntan lotion was definitely required. 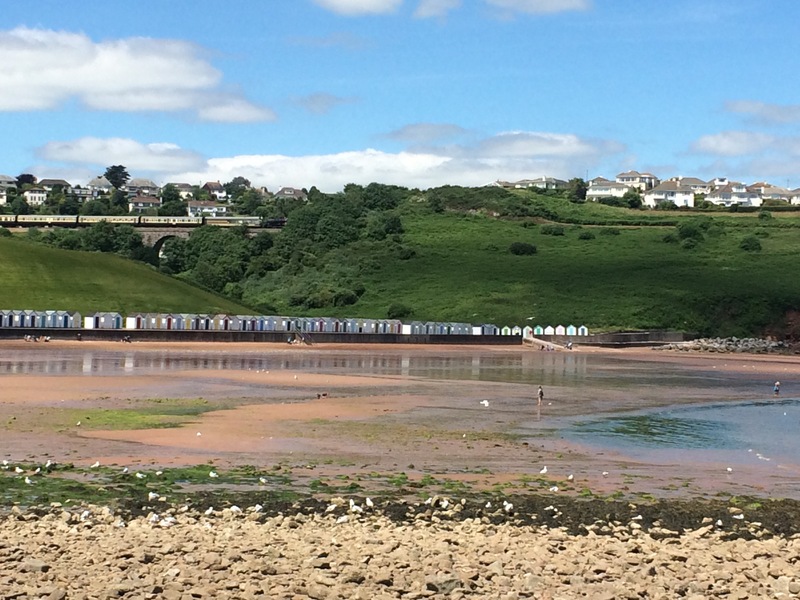 Shaldon was quite pretty, facing Teignmouth across the river. 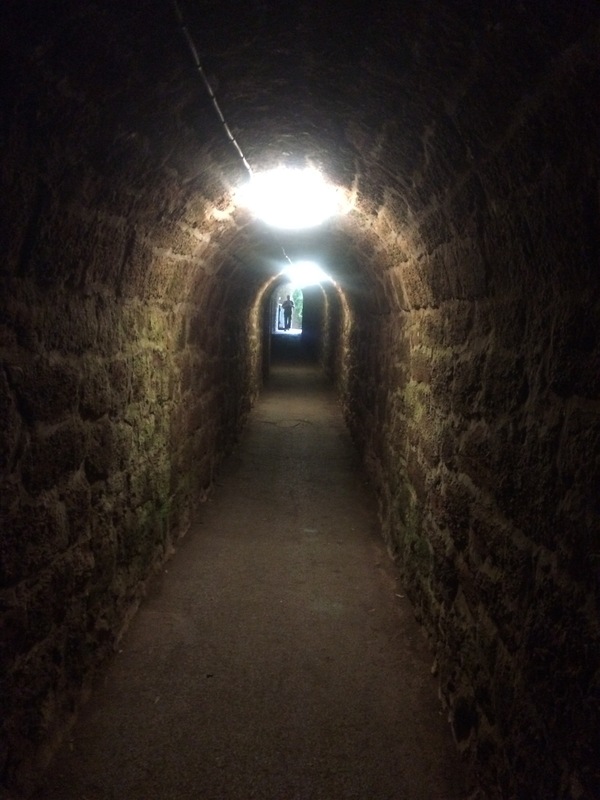 Ness Beach is accessible through a, very long, smugglers’ tunnel. 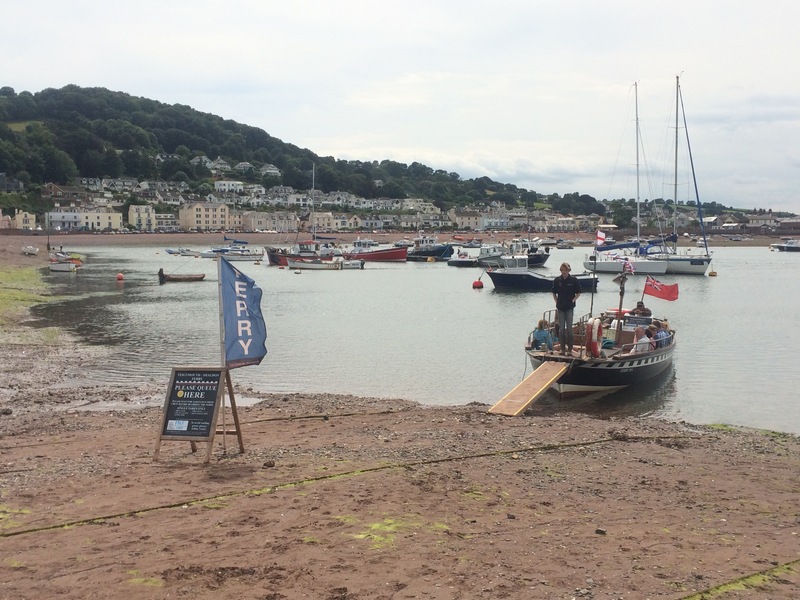 I caught the small ferry across the River Teign and wandered along Teignmouth promenade to meet Holly. Despite being sweaty, I was cooling down as clouds started rolling in and I can’t say the sea looked too inviting, so I didn’t go in. 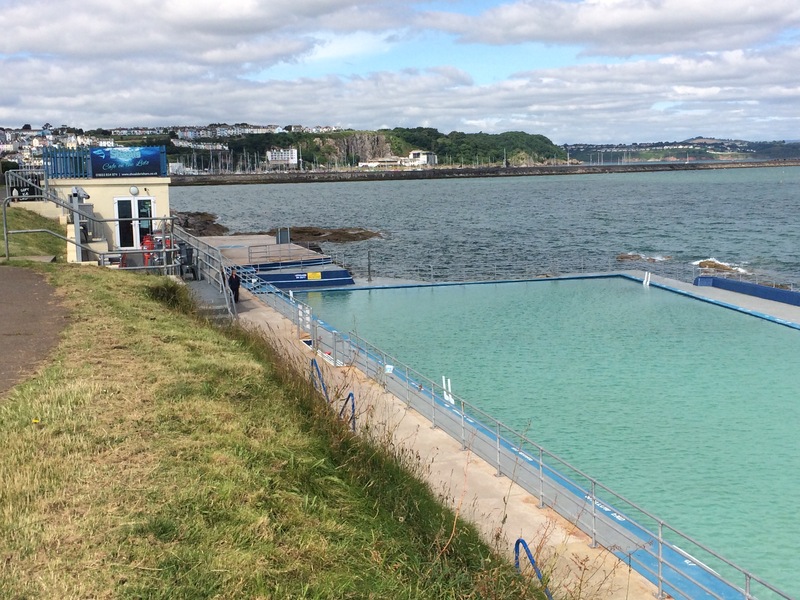 I did like the look of Teignmouth Lido though. For the first time in at least a week I woke up and my tent was dry. Typical then that I should prepare to set off early and, just as I came out of the toilet block, it rained. It was only a short shower, but enough to delay me 45 minutes while I dried my tent. 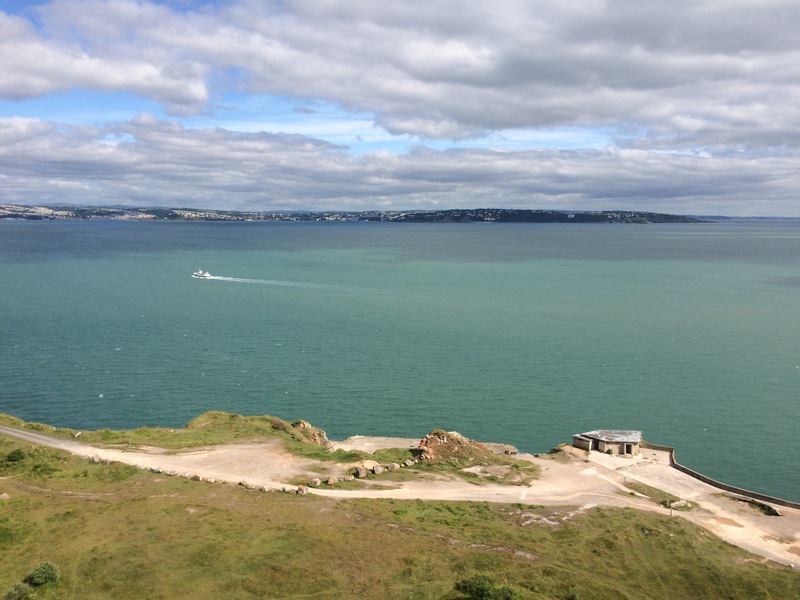 It was nice to walk around Berry Head, the Southern end of Tor Bay, with good visibility. 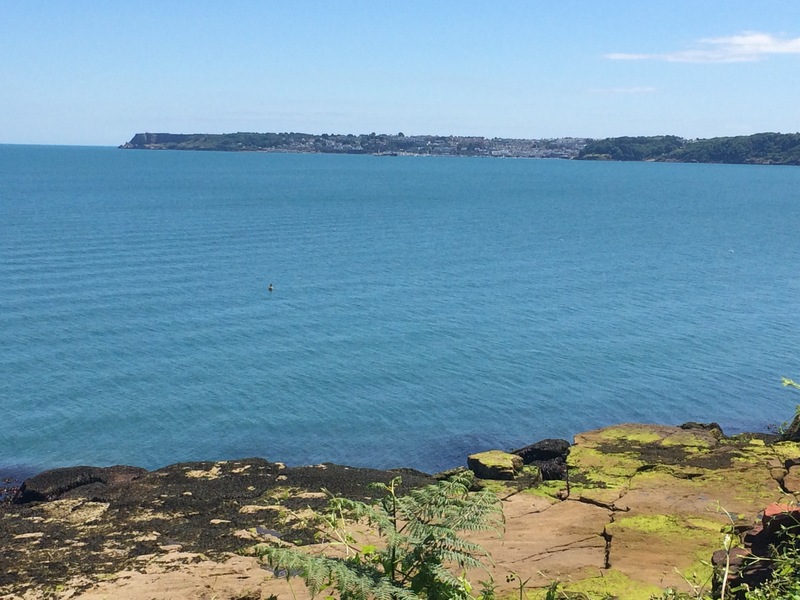 This headland is now a country park, complete with ruins of a Napoleonic Fort. 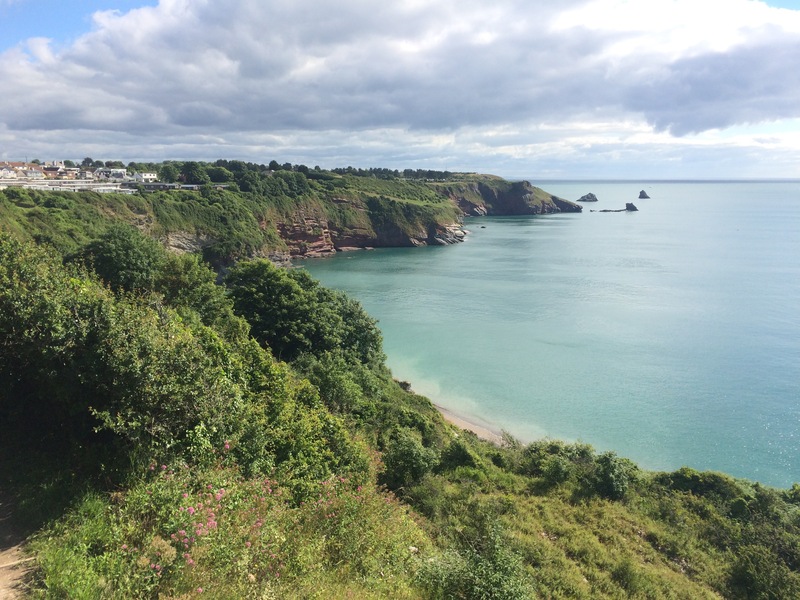 The iron ore and ochre found in these limestone cliffs was used to develop the first rust-resistant paint, another string to Brixham’s bow. Rounding Berry Head I got an incredible view all around Tor Bay. The red sandstone cliffs really stand out, amongst the amorphous mass of buildings. 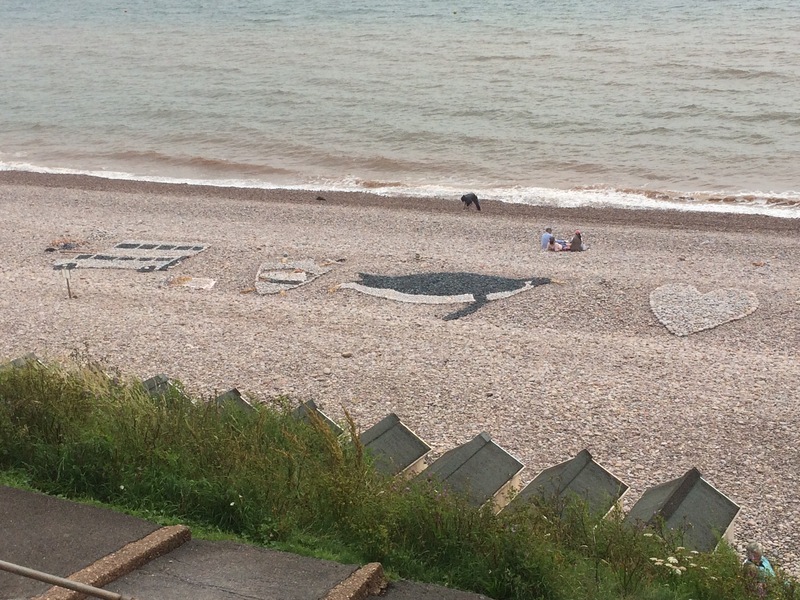 The English Riviera really is quite crowded. 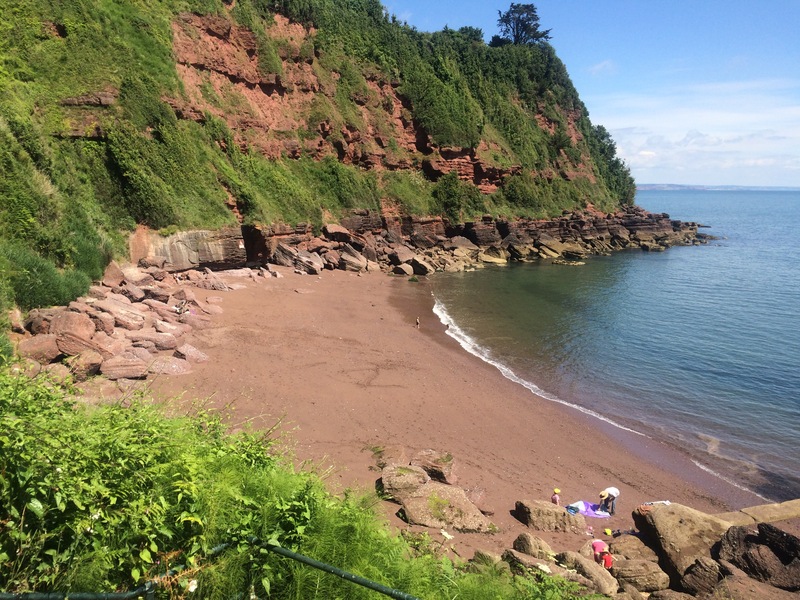 I passed through Brixham Harbour, Elberry Cove, and on to Broadsands, the first of the main beaches (Goodrington Sands, Paignton and Torquay being the others). 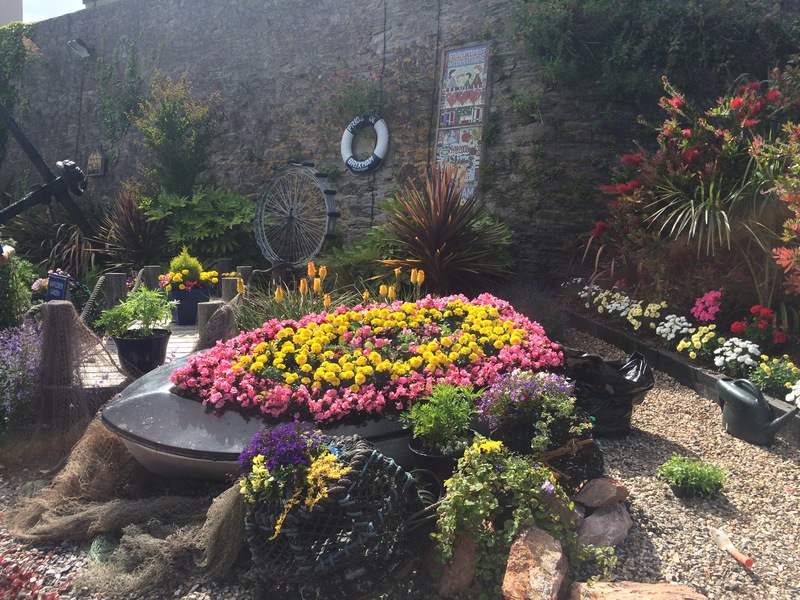 I liked that Brixham had lots of small gardens that were being tended by volunteers who worked under the strap line “Pride in Brixham”. 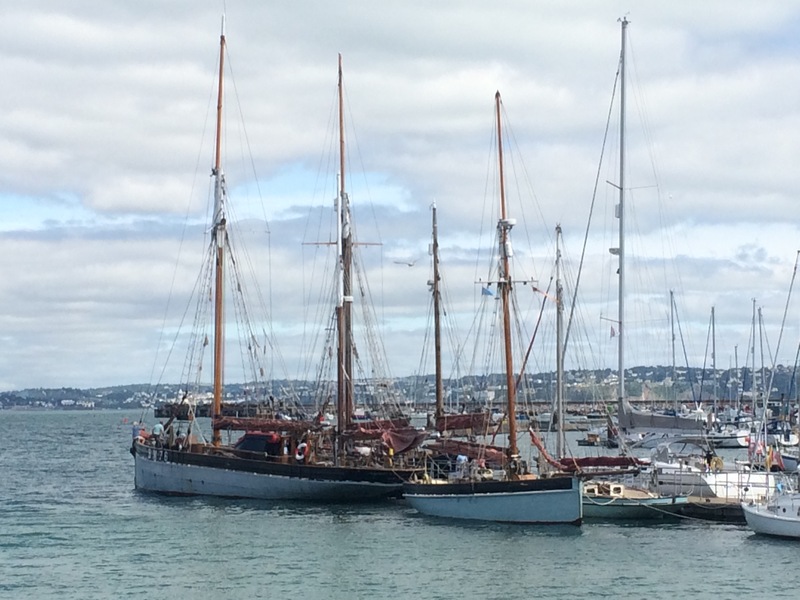 The town also keeps a “heritage fleet” of old fishing sail ships running for groups and young people to experience sailing. Approaching Broadsands I could hear a steam train, and then I saw it, the Paignton and Dartmouth Steam Railway. 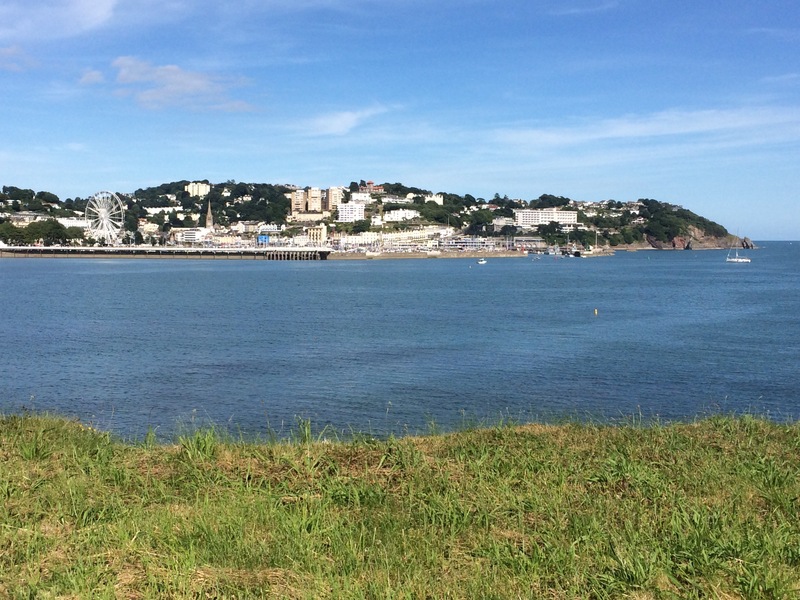 In the sunshine, walking along The English Riviera, which has a certain style and air, I felt like I’d been transported back to a 1930s Agatha Christie novel. 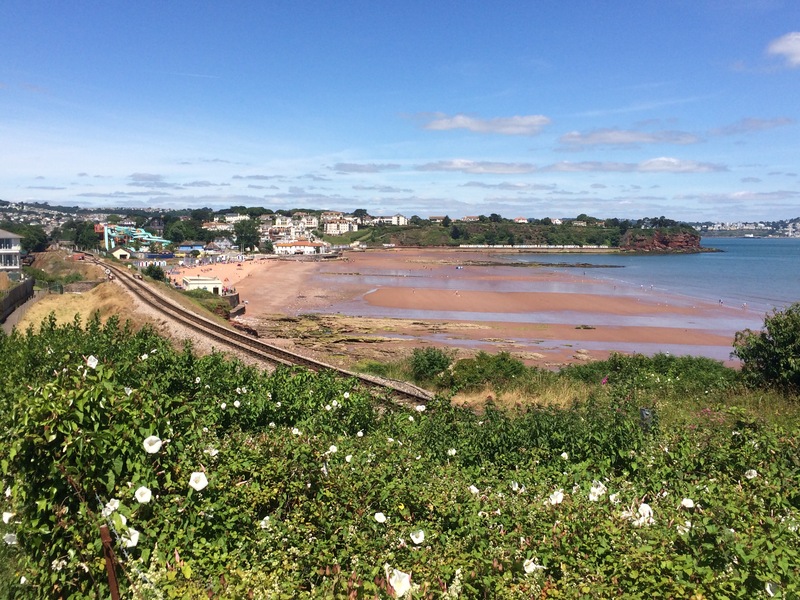 I’m pretty sure I saw Poiriot in the train window – he must have been heading to the Burgh Island Hotel to investigate a murder! 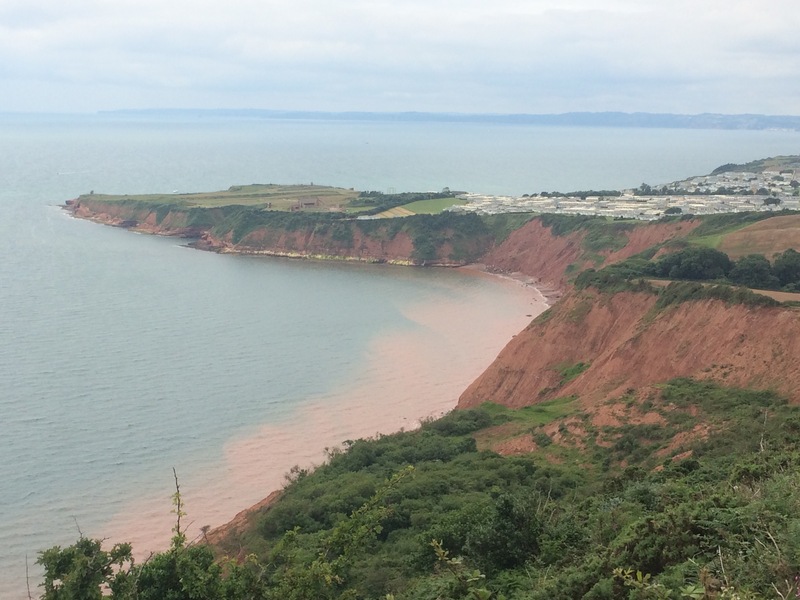 After all the beautiful, golden, sandy beaches I’ve passed, it was strange to see the ochre-red colour of these beaches. 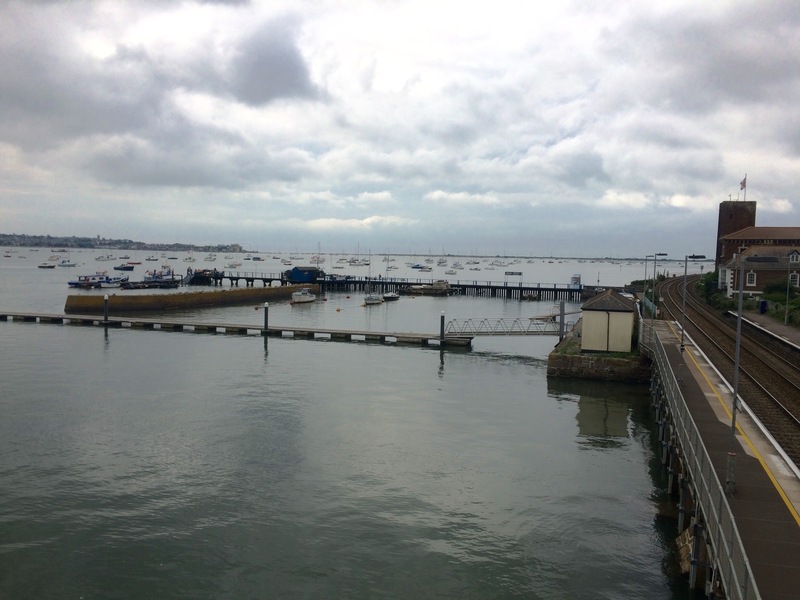 The sea also looked different, no longer clear, but opaque. The setting was stunning. On this hot day there were plenty of people enjoying the beach and the sea. 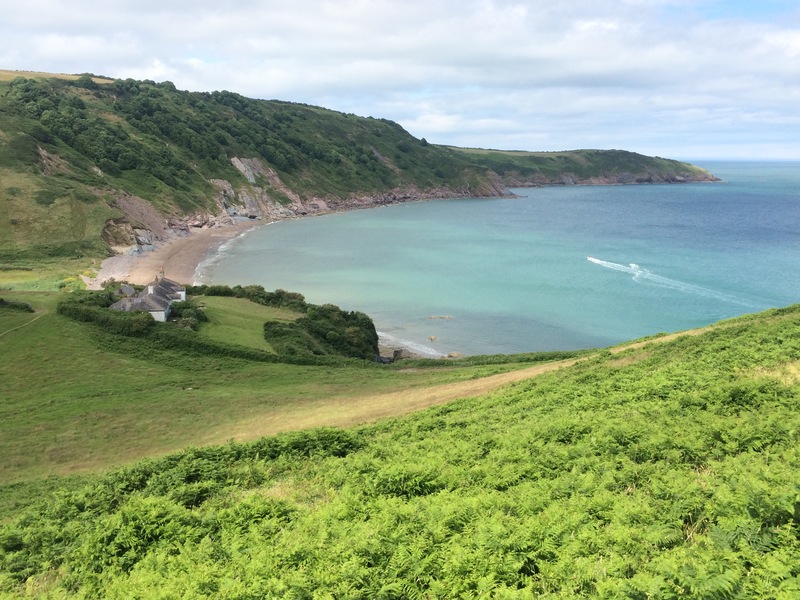 I assumed that because Tor Bay is a very deep bay it is therefore sheltered and the sea generally calm. I came to this conclusion because none of the beaches had lifeguards, instead they had “beach managers”. 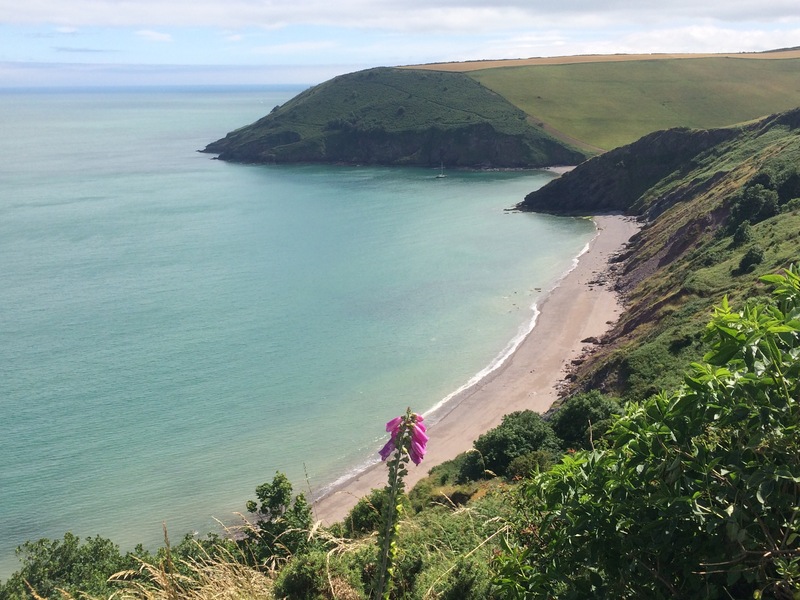 Tor Bay really is a holiday Mecca. There was a huge water park and plenty of amusements and shops. 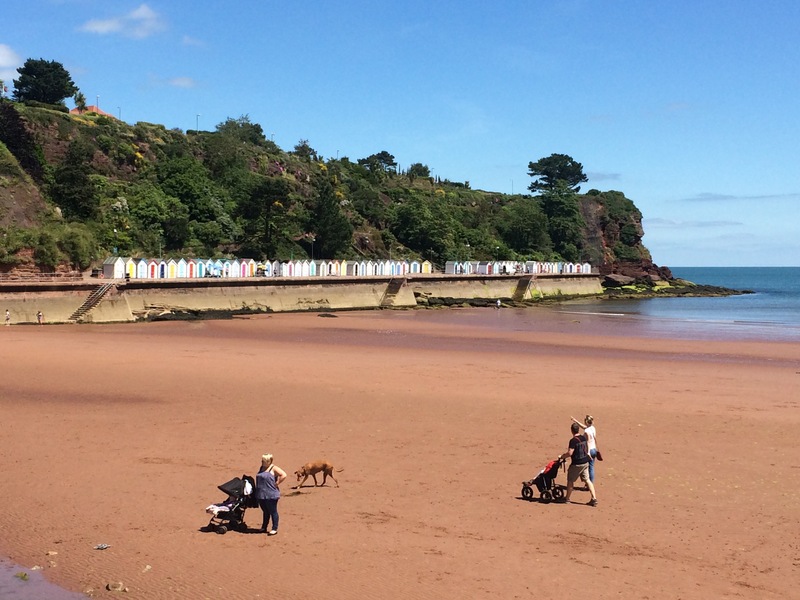 Paignton had all the fun of Blackpool, but with more consistent sunshine and warmth. 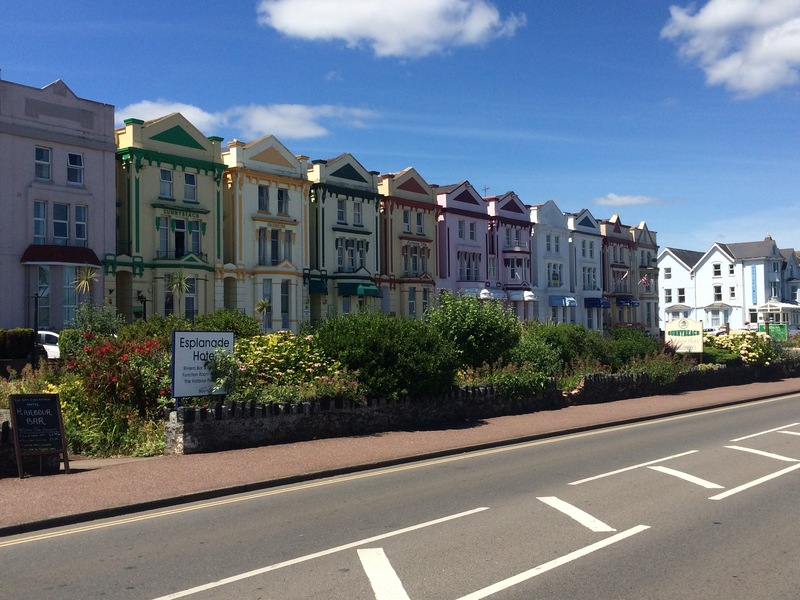 When I reached Paignton I veered off the wide, grassy promenade and walked up the main tourist street into town, heading for the Victorian Times tea shop. Gary and Deb, friends who own the tea shop, were expecting me for lunch. 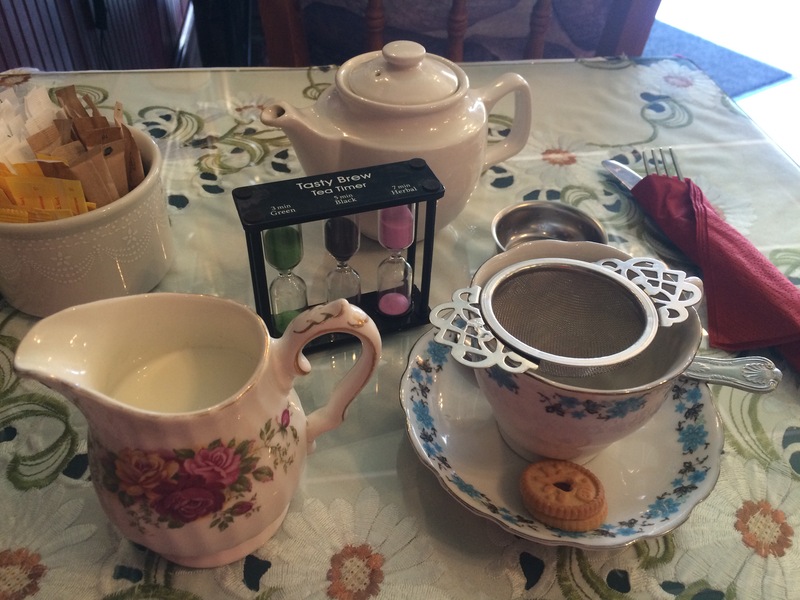 I was delighted to be treated to proper tea, in a teapot, and some delicious homemade food. I had a 2-hour break and could have stayed longer. 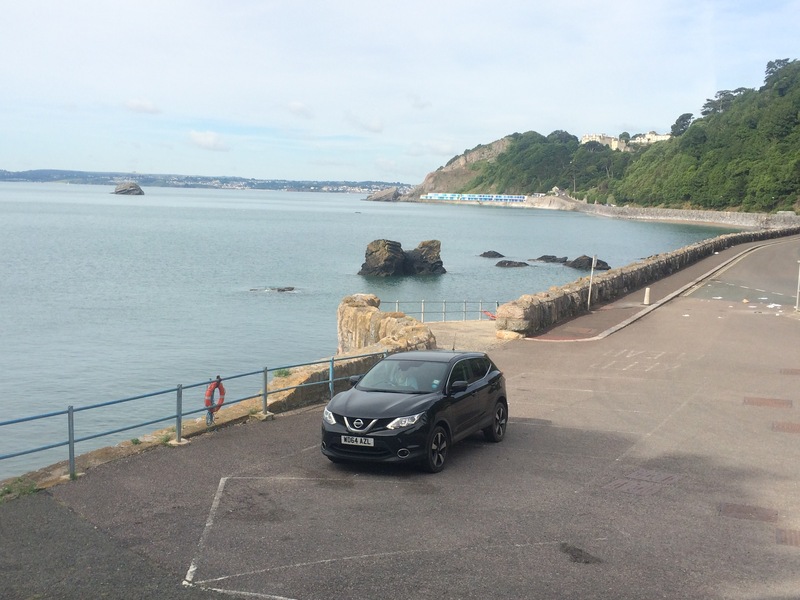 It was still hot and sunny when I left Gary and Deb (with another cake for later) and headed around to Torquay. The marina had several expensive-looking boats in it and the old town behind it reeked of faded gentility. The Pavilion was boarded up and crumbling, a bit like some of the enormous old houses on the cliff. Newer additions to the town looked to be a big wheel (smaller than the London Eye but same concept) and a place called Living Coasts, which is a zoo of sorts and covered by huge netting. Holly kindly came and picked me up from Kilmorie, almost at the far end of Tor Bay. 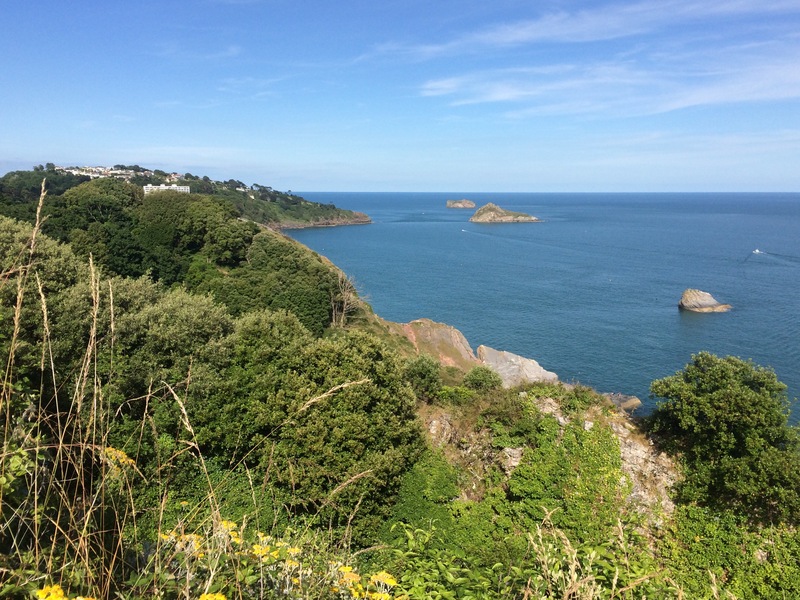 It had been a beautiful, slightly surreal, and very hot walk around the whole of the bay, the heart of The English Riviera. 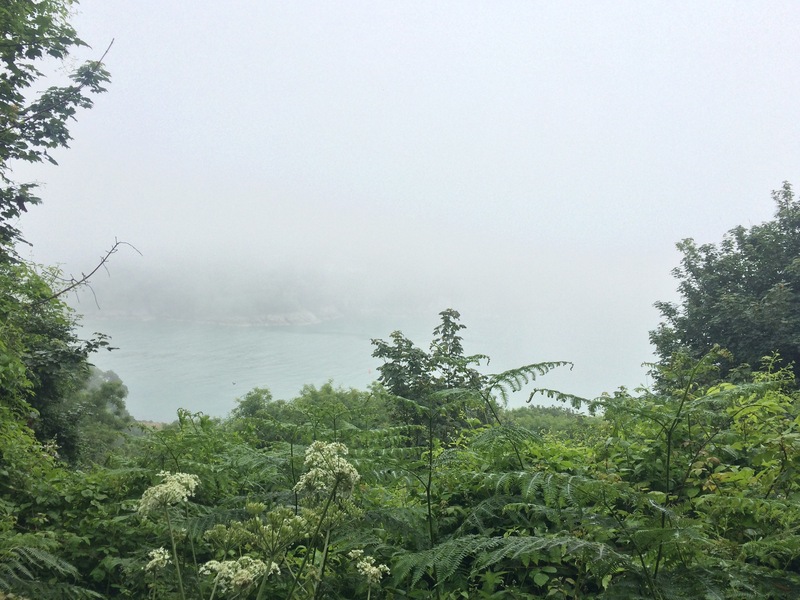 It was very wet this morning and there was a thick fog. There was no way my tent was going to dry out so I packed it away wet and set off. I followed the road and a track out of Stoke Flemming, rather than the cliff path, as I would have just got soaked by the undergrowth and seen nothing anyway. 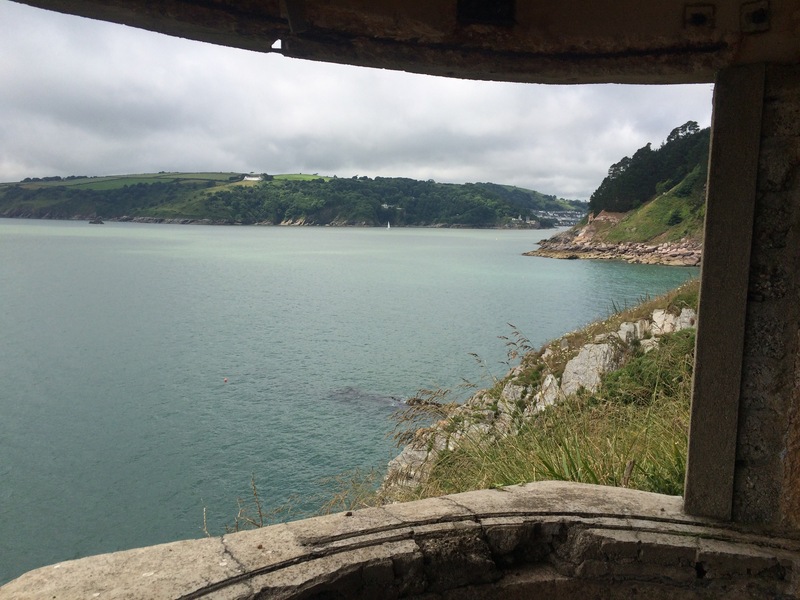 There was no point climbing up to Gallant’s Bower Civil War Fort for the views across the Dart Estuary. 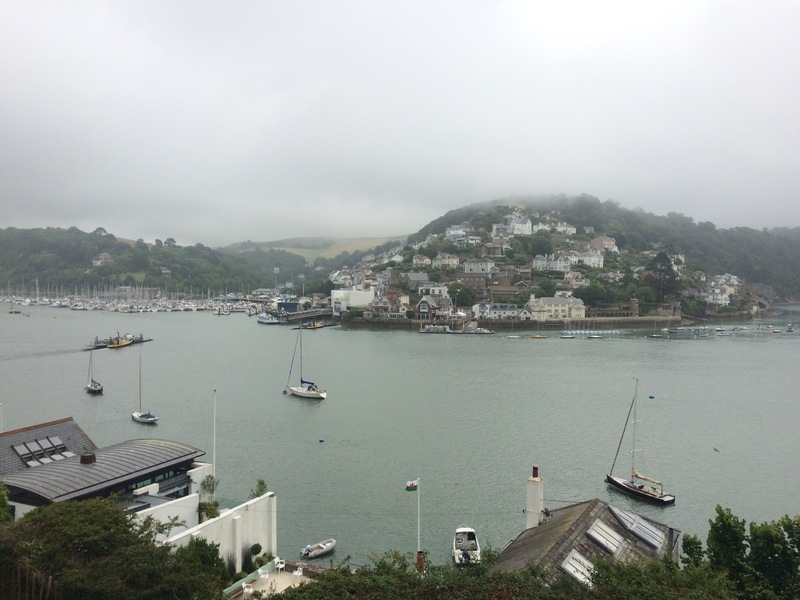 I reached the River Dart at Dartmouth Castle, which sits facing Kingswear Castle, both guarding the narrow entrance to the estuary. 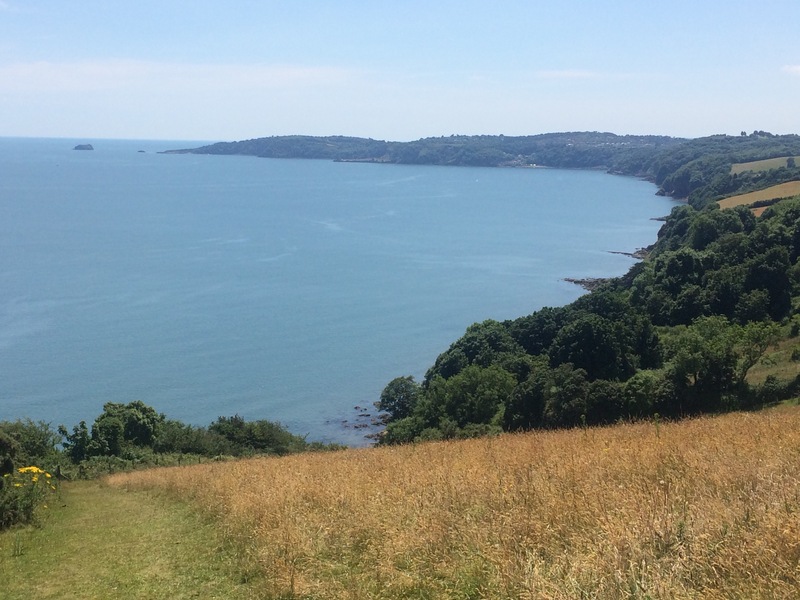 Like the Yealm Estuary, the Dart Estuary is actually a Ria, and very pretty, its steep sides covered in trees. 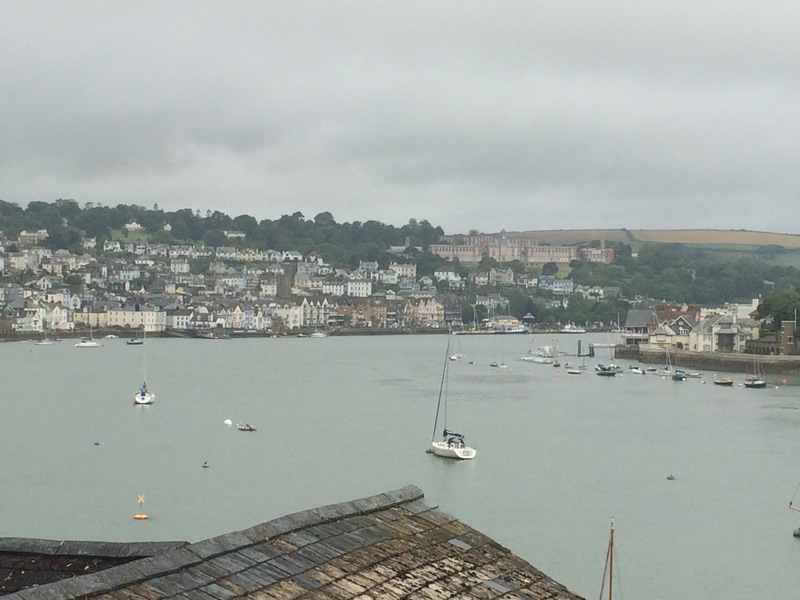 It was raining when I walked past all the big houses set into the hillside and into Dartmouth town; another town with a harbour full of pleasure craft. This one looked like it could be as rich as Salcombe if the people with money arrive and do up the grand houses. The town is dominated by Dartmouth Naval College, which stands proudly on the hill. 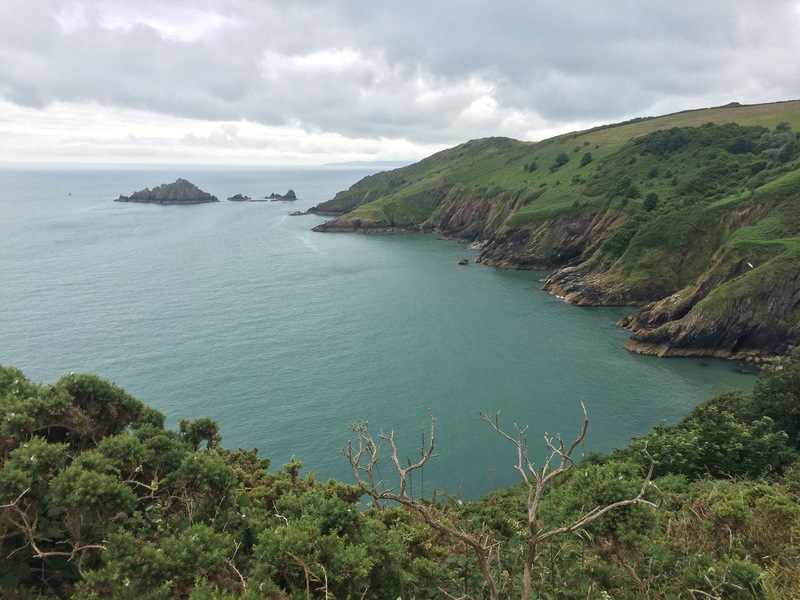 I passed the aptly named Warfleet Creek, where the Royalist troops attacked Dartmouth in 1643, only for the Parliamentarians to win the town back in 1646. I took shelter from the rain in Alf Rescoes cafe, which I can thoroughly recommend for an excellent breakfast. Unfortunately, it didn’t stop raining. 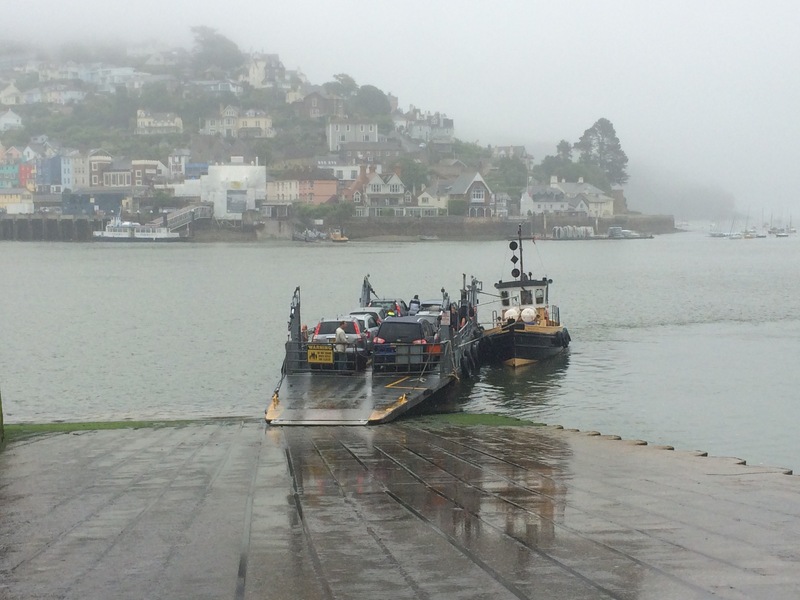 I caught the vehicle ferry (actually just a platform pushed across the river by a tug boat) across the River Dart to Kingswear. 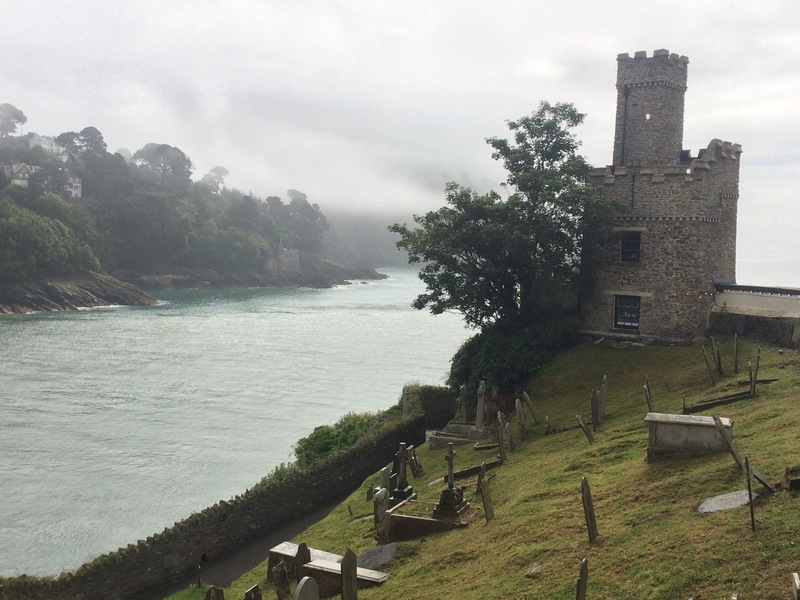 This town is older than Dartmouth and was a popular landing site for pilgrims travelling to Kent to pay homage to the murdered Thomas à Beckett. I set off through the trees to Froward Point. Unbelievably, as I exited the trees at Froward Point, right next to the Lookout Station, the mist cleared, the sun came out and I was able to see for miles. Things like that remind me that I am a lucky person. Wow. 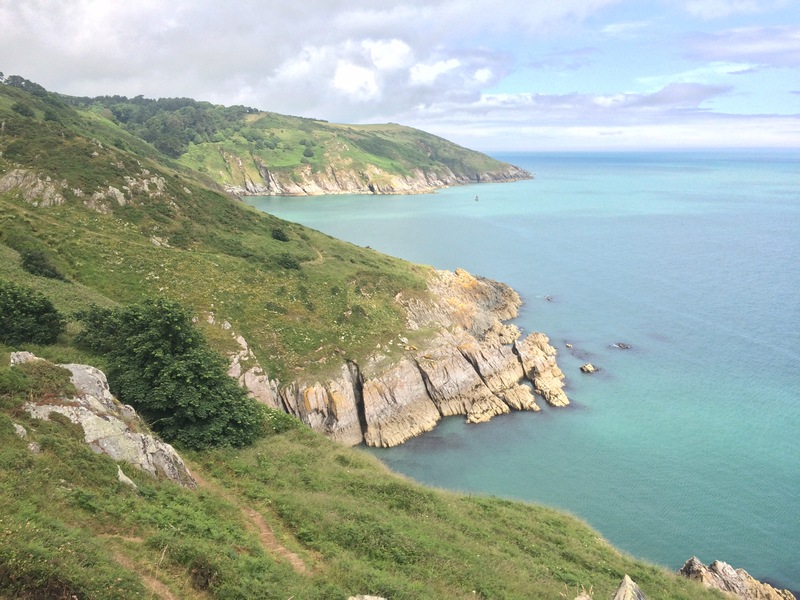 I could see right along Start Bay to Start Point and the sea looked amazing. After a quick chat with the old fellow in the Lookout Station I set off again. 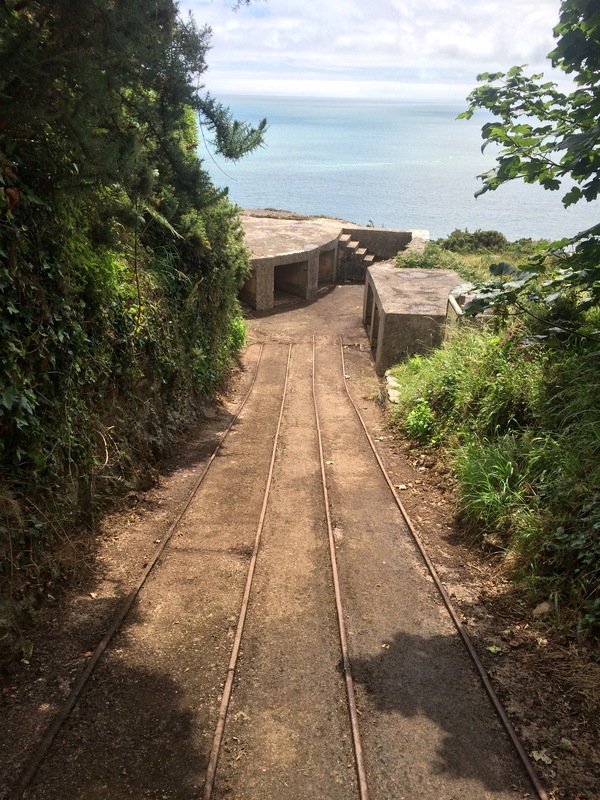 The path initially took me down the cliff to the Brownstone Battery, built in 1940 to protect the Dart Estuary. 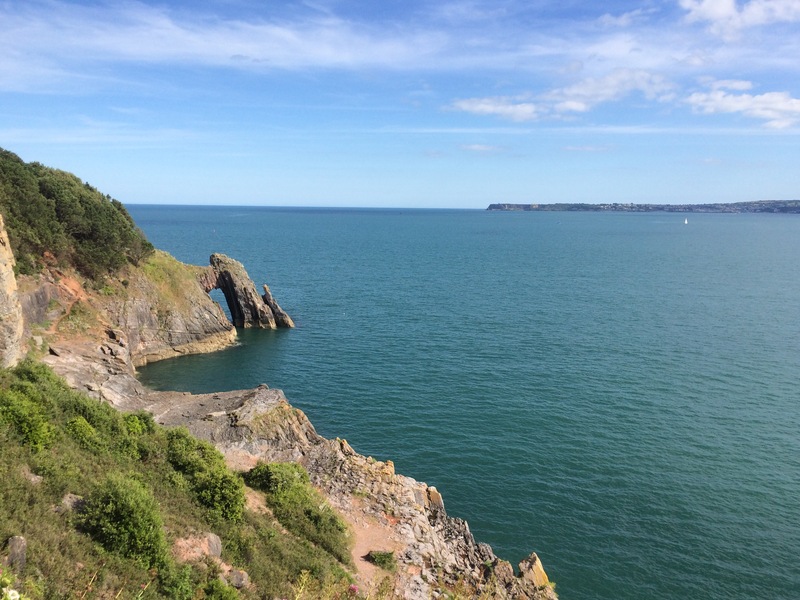 It was a brutal walk up and down the cliffs, in the hot sun, to Sharkham Point, just before Brixham. 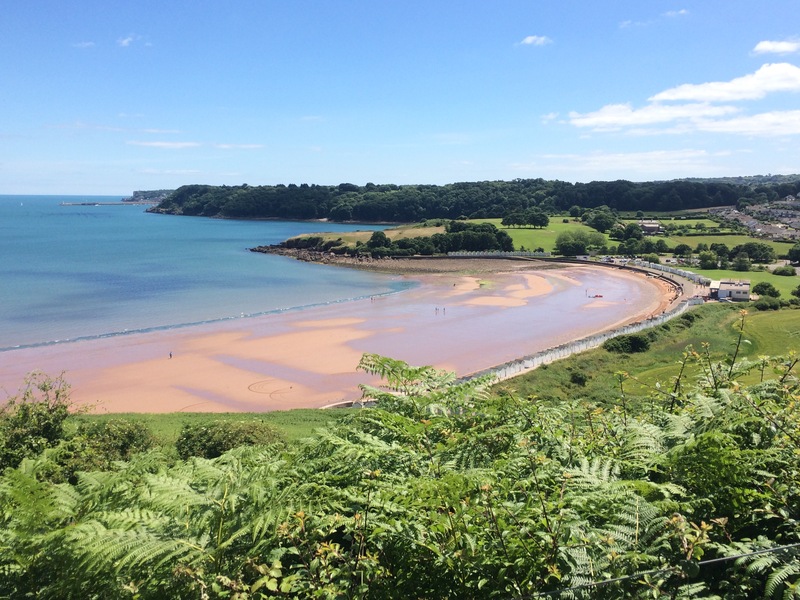 I passed a couple of lovely beaches, quite deserted other than a lone wakeboarder who was charging undisturbed around the bay. 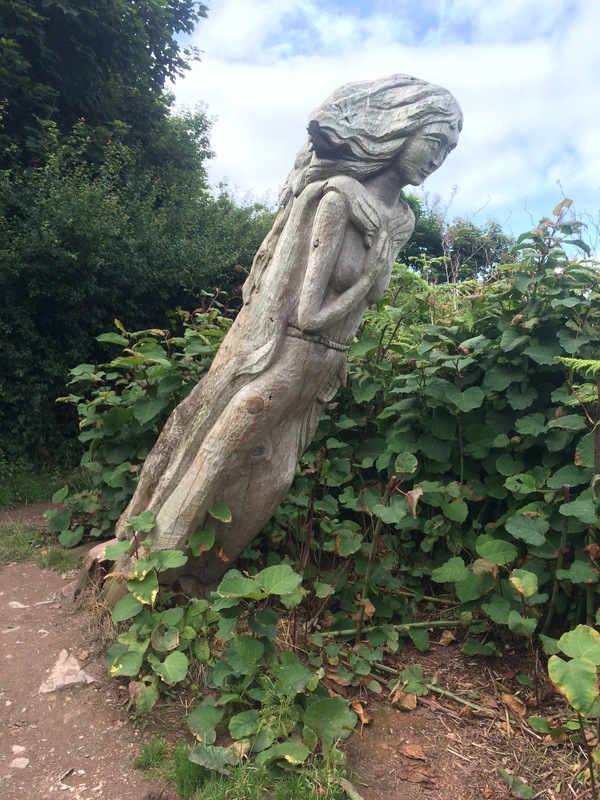 When I reached the carving of St Mary, overlooking the bay named after her, I turned into the suburbs of Brixham. 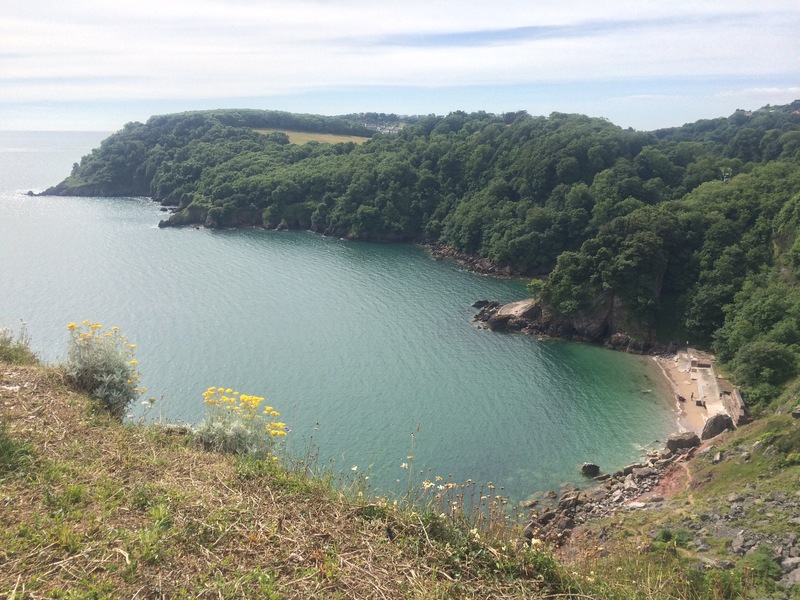 My campsite was right at the back of Brixham and had reasonable facilities so I was happy. 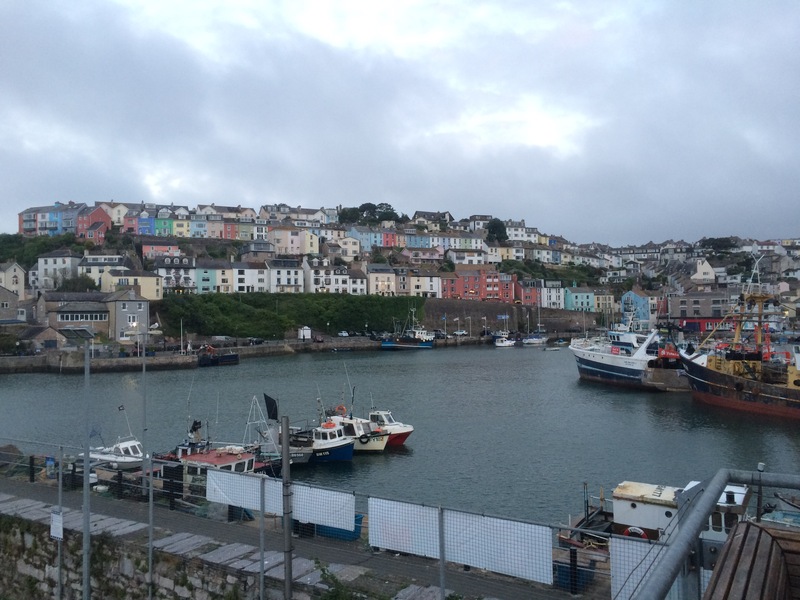 I was less happy with my 3-mile round trip down to Brixham Harbour for some dinner, but I found a nice (and expensive) restaurant overlooking the smelly fishing fleet so it was worth it. 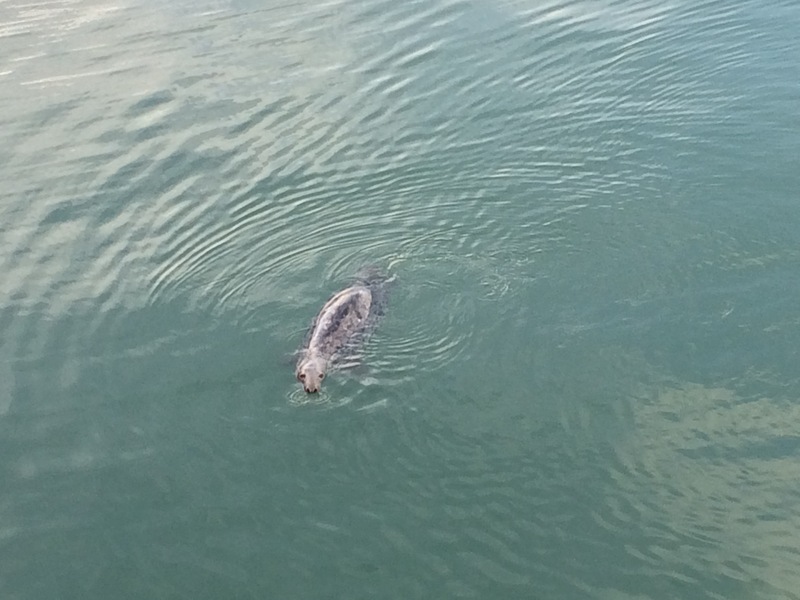 I ate a lovely fish supper on the Rockfish restaurant balcony and watched a lone seal in the harbour that almost looked like it was begging for scraps from us diners. 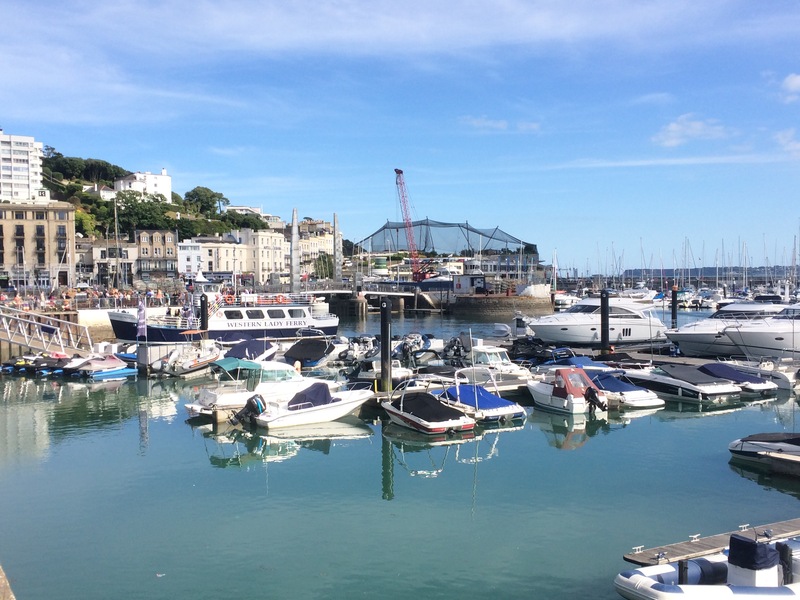 My walk through Brixham convinced me that this was not an affluent town, nor was it focused on the tourist industry, like most towns I’ve passed through. 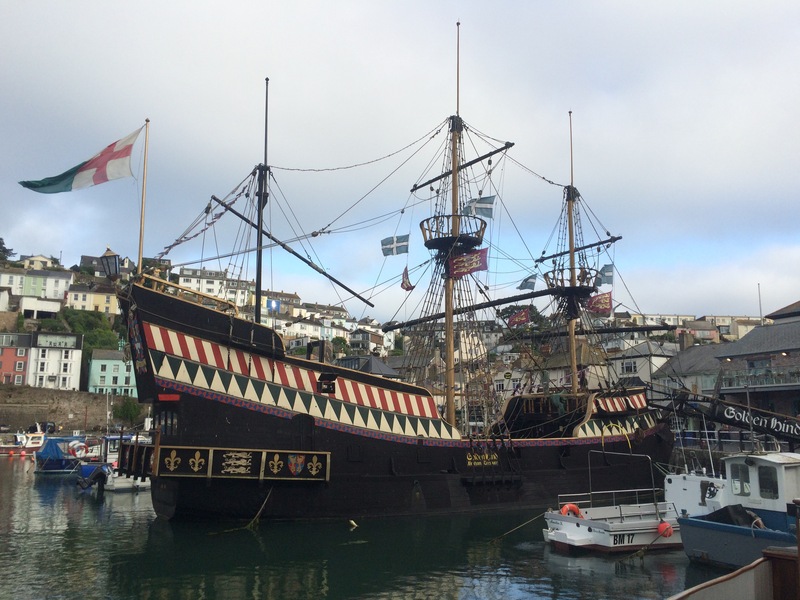 Brixham is a major fishing port with an interesting history. William of Orange landed here in 1688 on his way to claim the throne from King James II. 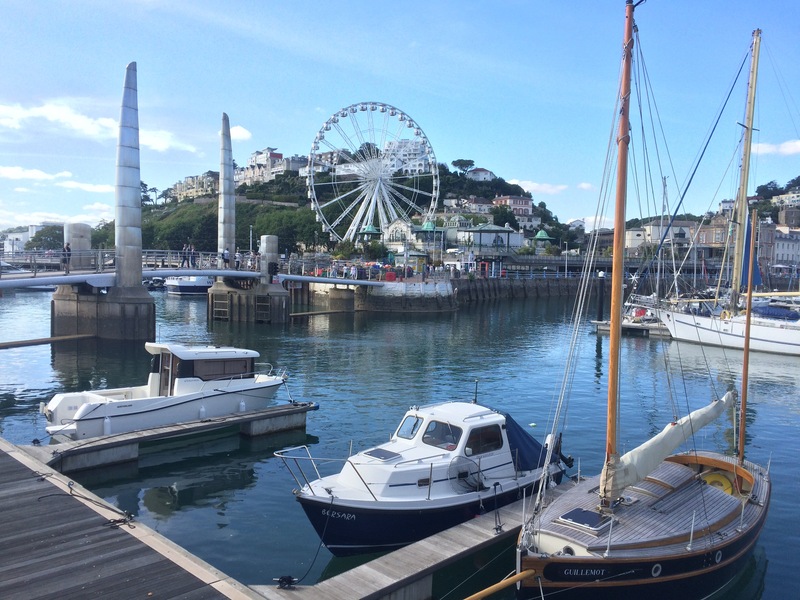 However, it was in the late 1800s that Brixham came to prominence as Britain’s largest fishery because this was where trawling was introduced. 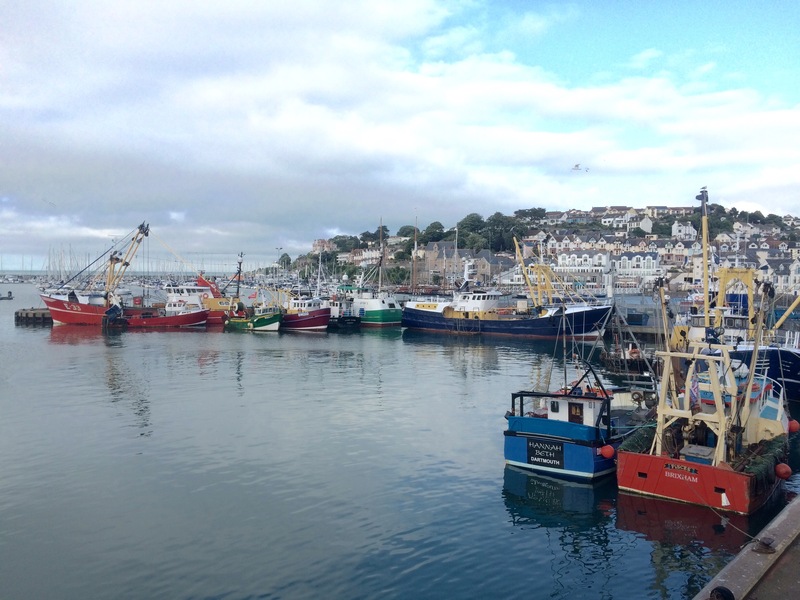 Brixham claims to be responsible for the rise of the East coast fishing ports, such as Hull and Grimsby, which ultimately overtook Brixham, although it regained its crown as England’s largest fishing port in 2000. 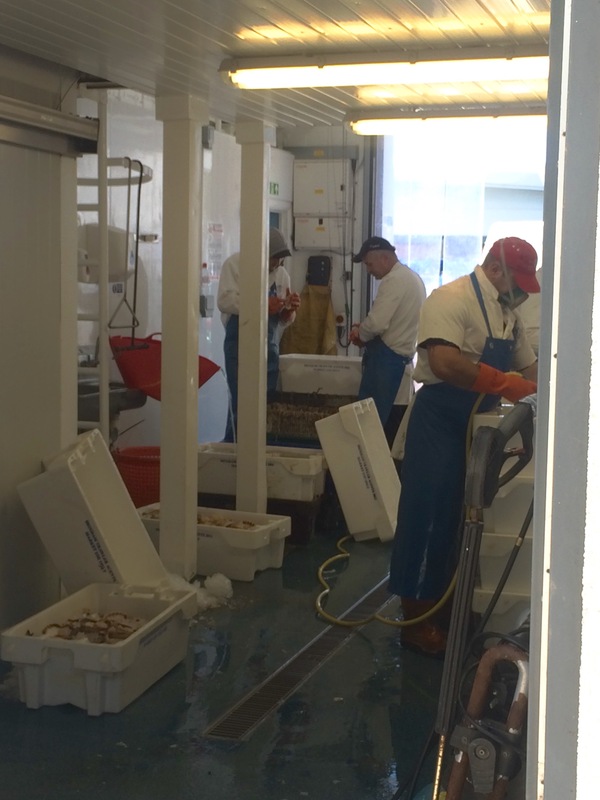 There were certainly a lot of trawlers in the harbour and a big fish processing factory.